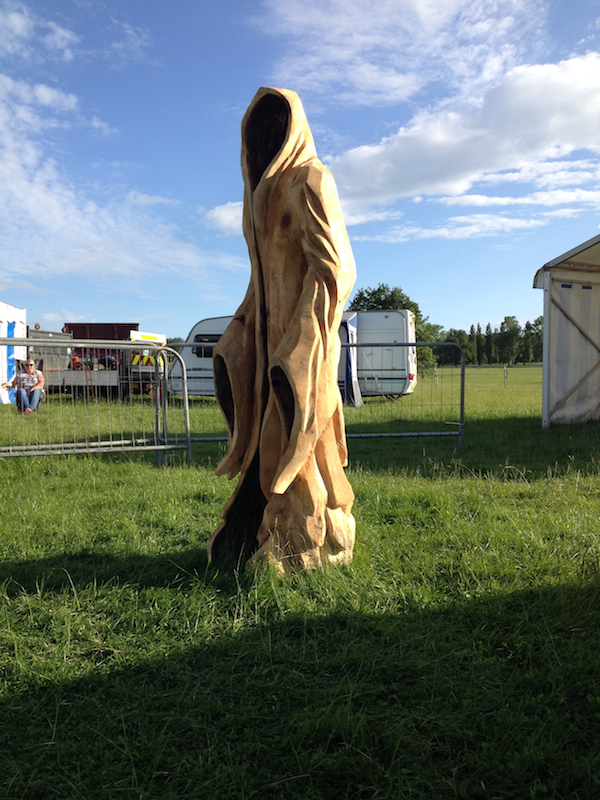 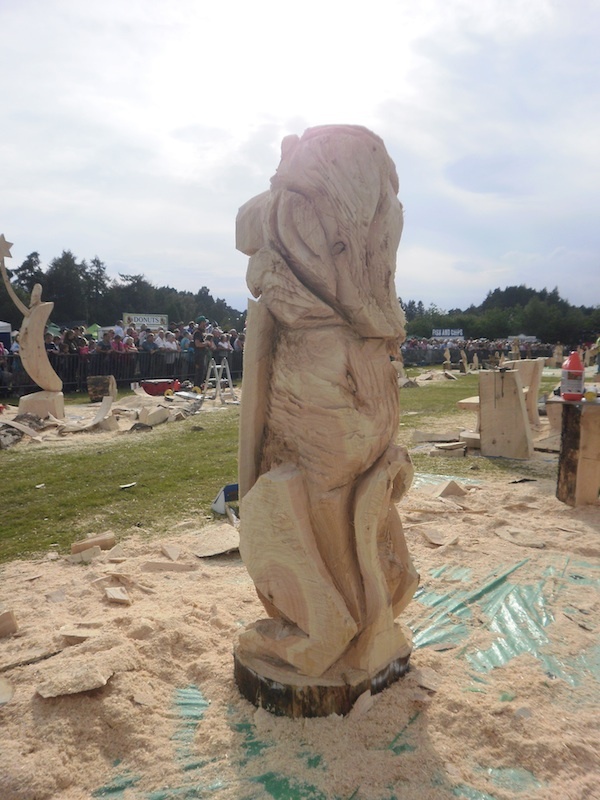 Germany V Great Britian Chainsaw competition 2014 The book of JK Rawlings Harry Potter series has a very dark character called a Dementor which is a sinister version of the Dementer (Greek goddess of the harvest). 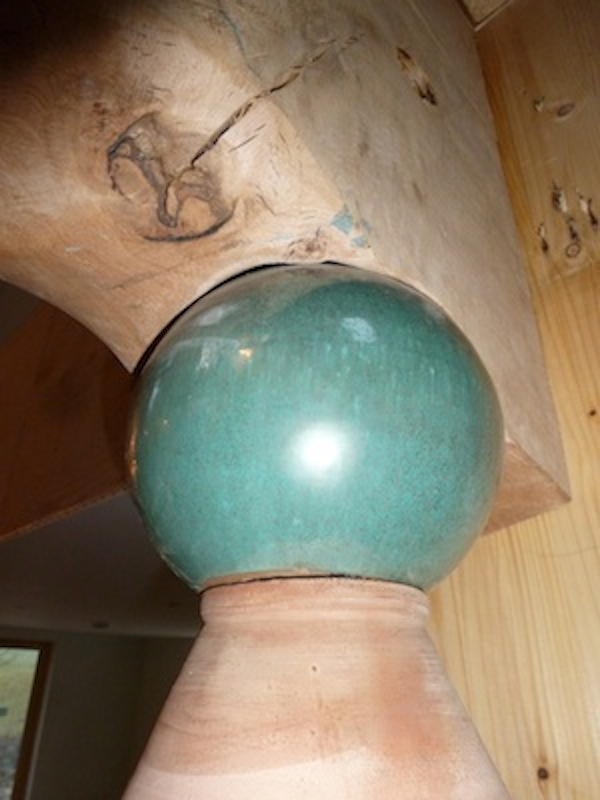 Arch and pots over kitchen entrance. 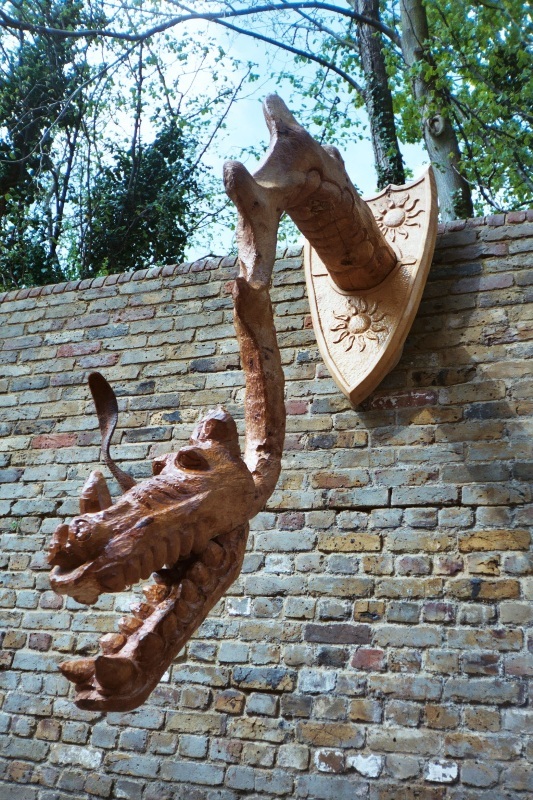 This bespoke nature inspired chainsaw carving archway and post was commissioned to bring bold decorative forms of nature in-doors. 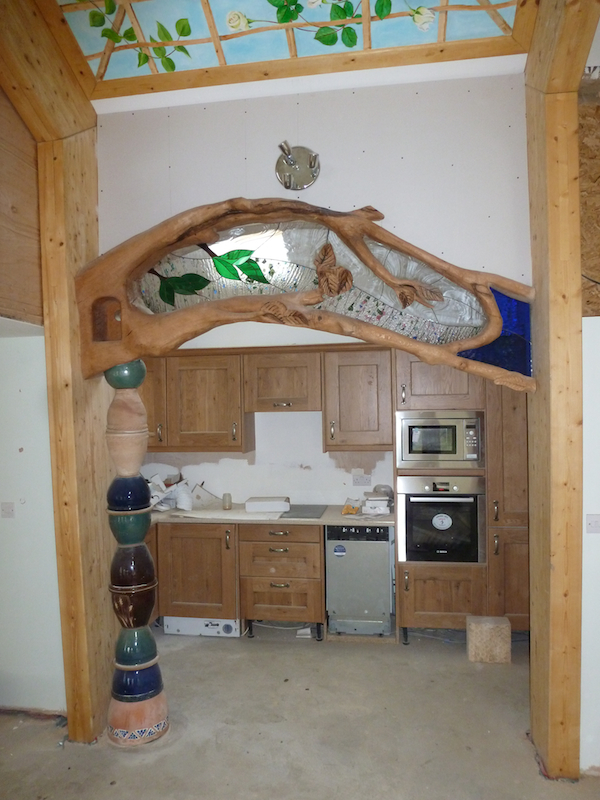 The post form found to the left of the archway was inspired by the work of Friedensreich Hundertwasser; an Austrian artist famous for his original and unruly artistic vision. 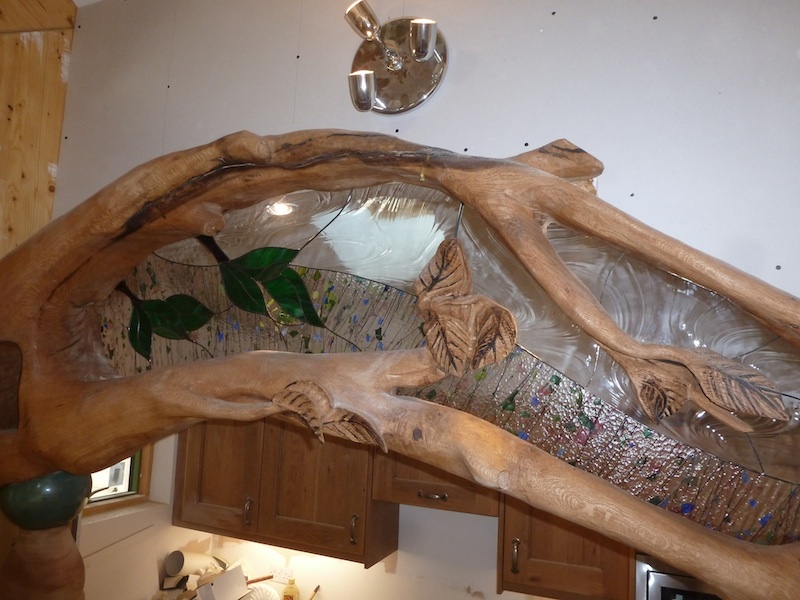 Techniques include: Chainsaw Sculpting, Detail Sanding, Glass Inlay and Installation. 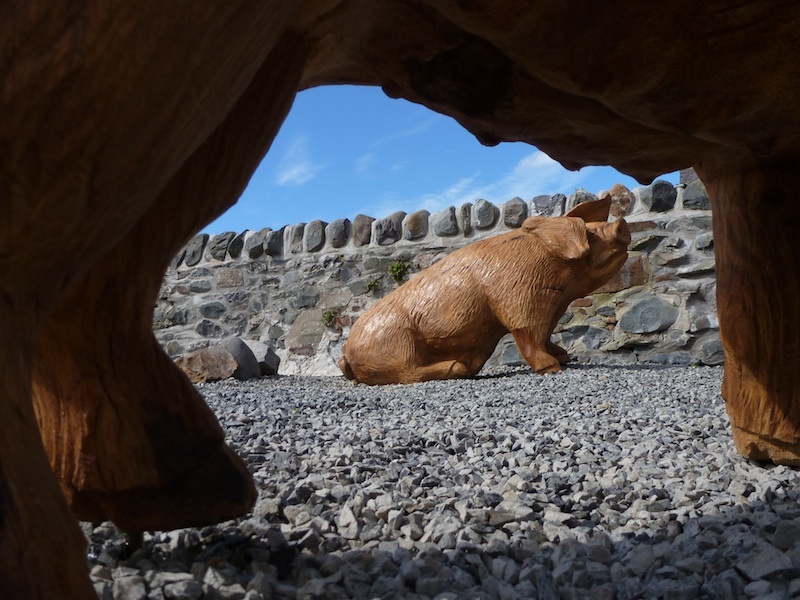 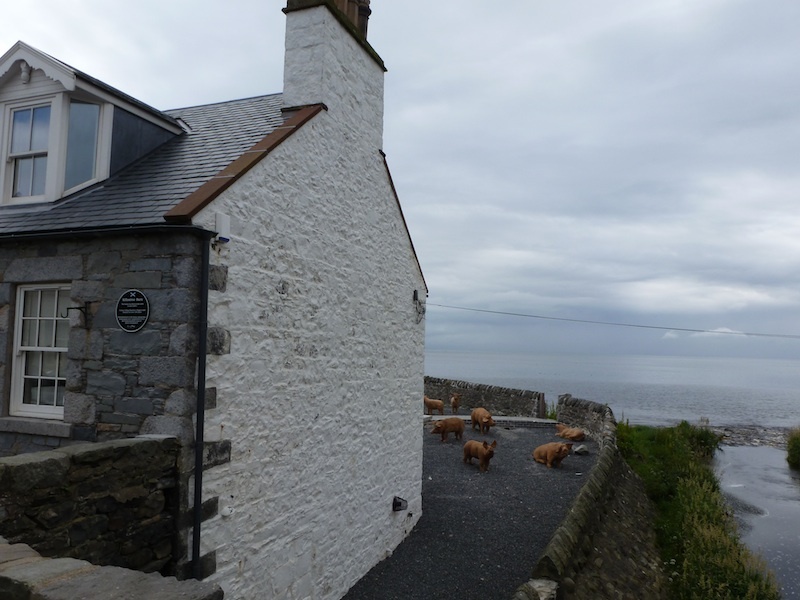 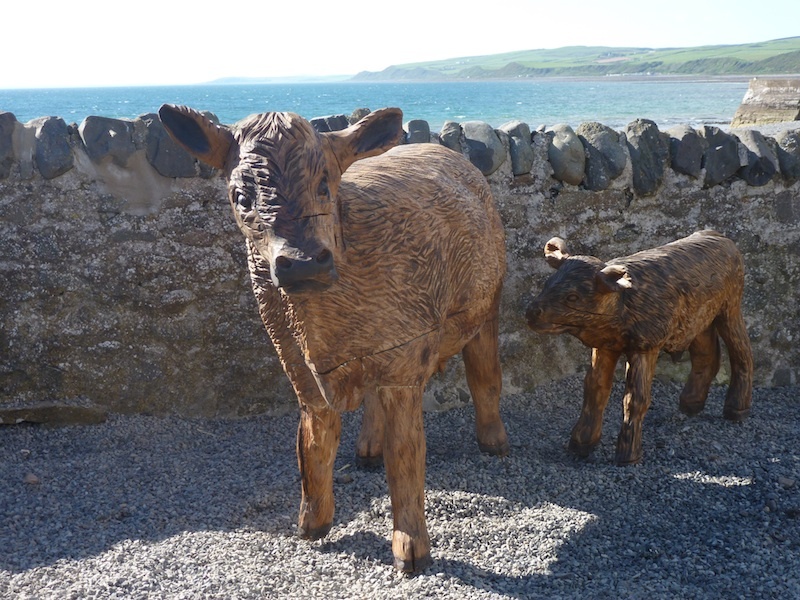 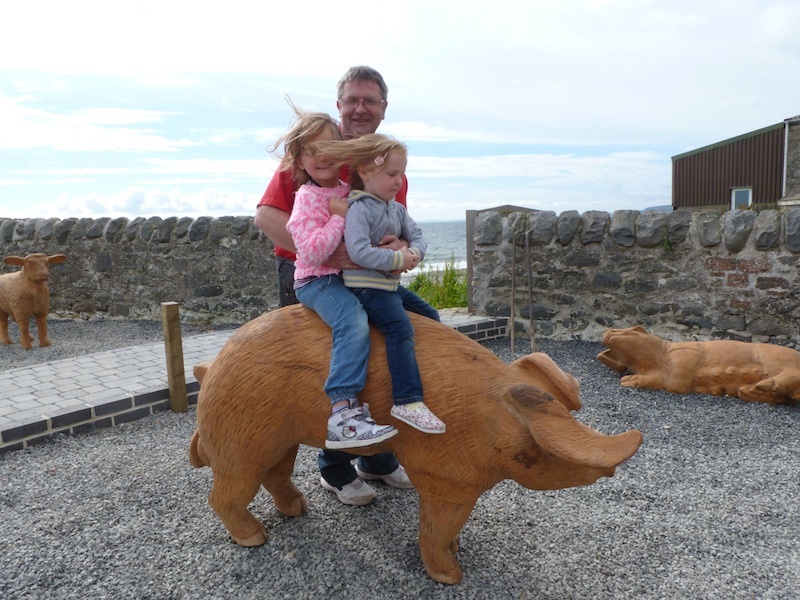 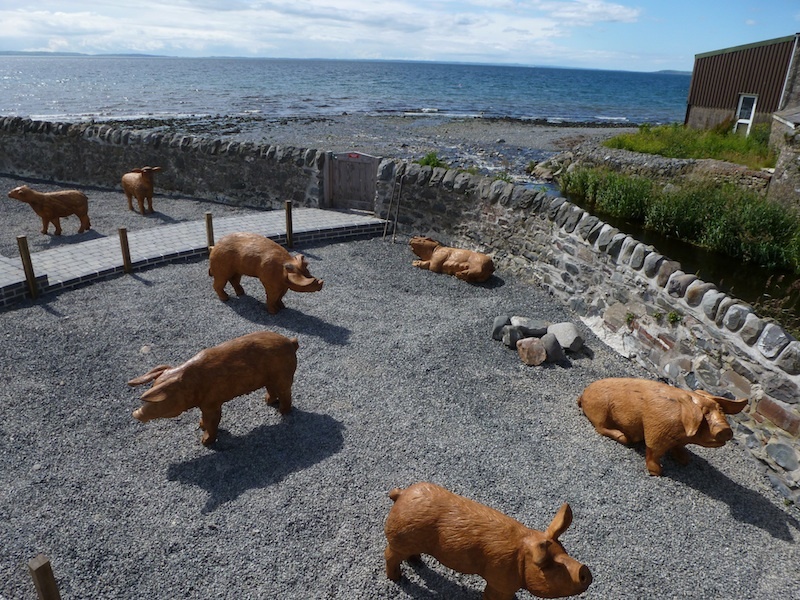 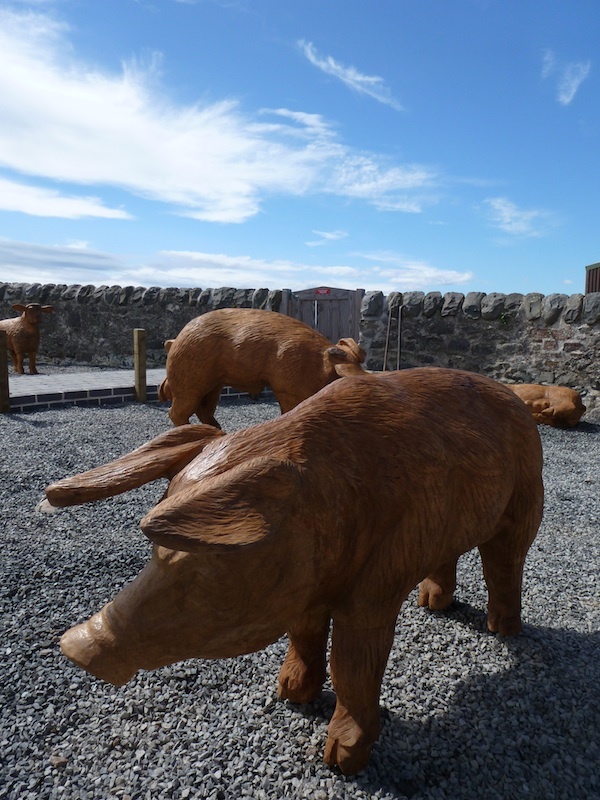 Five pig's and two sheep where commissioned by the owners of Killantrae Burn Holiday Cottages in Port William, Galloway on the West Coast of Scotland . 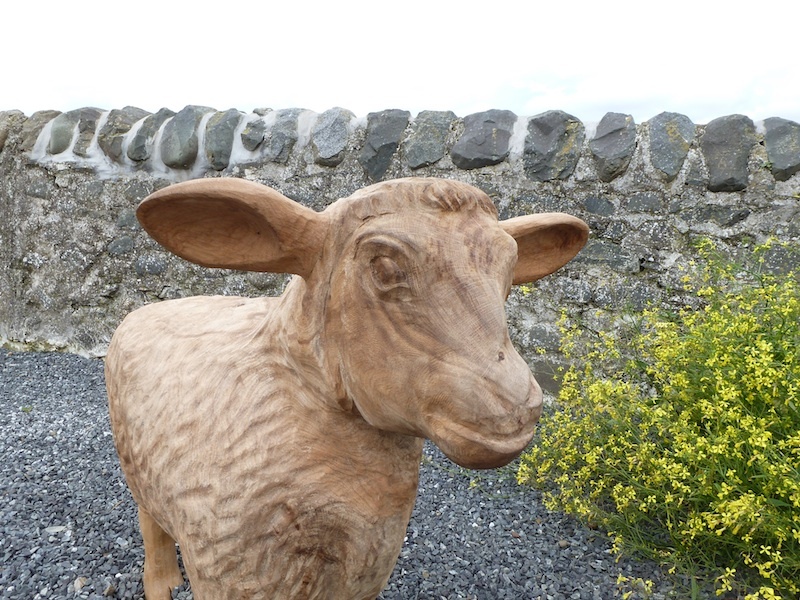 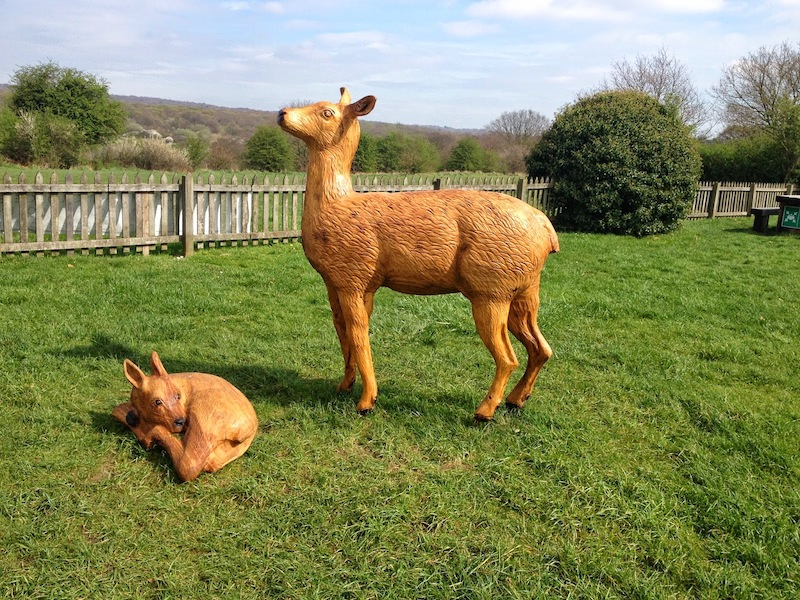 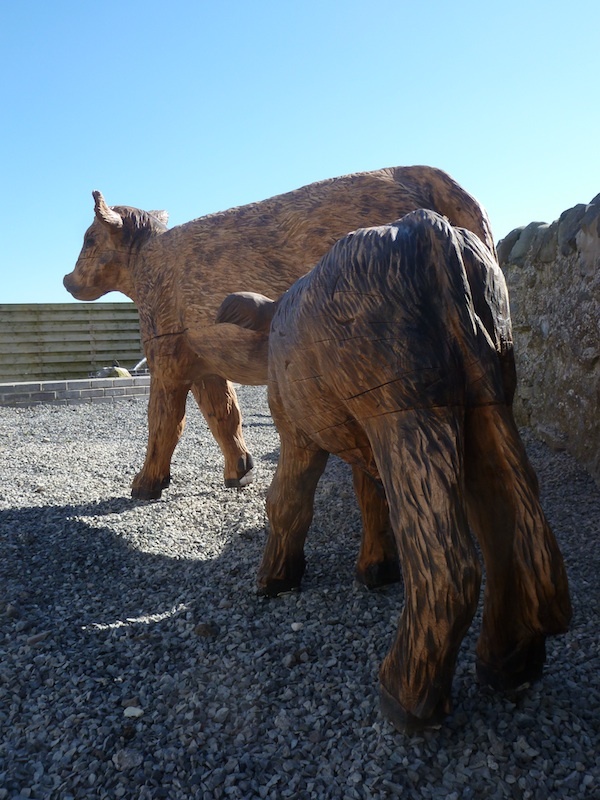 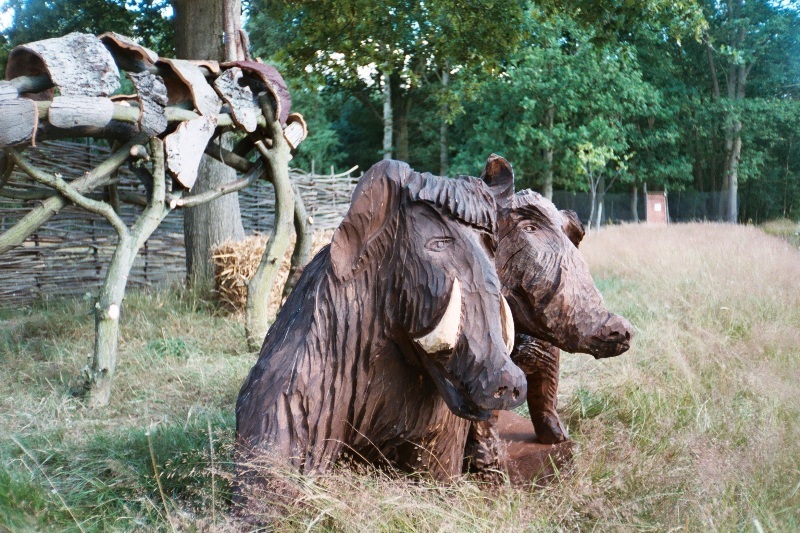 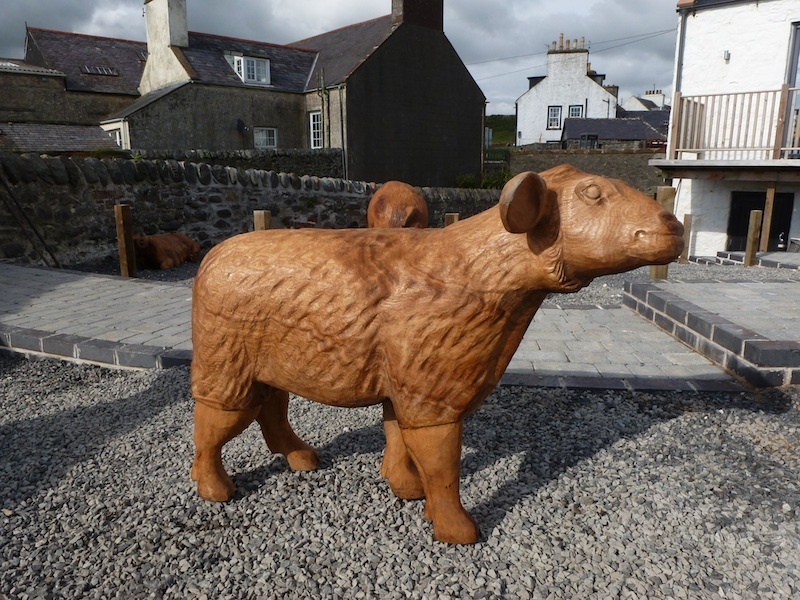 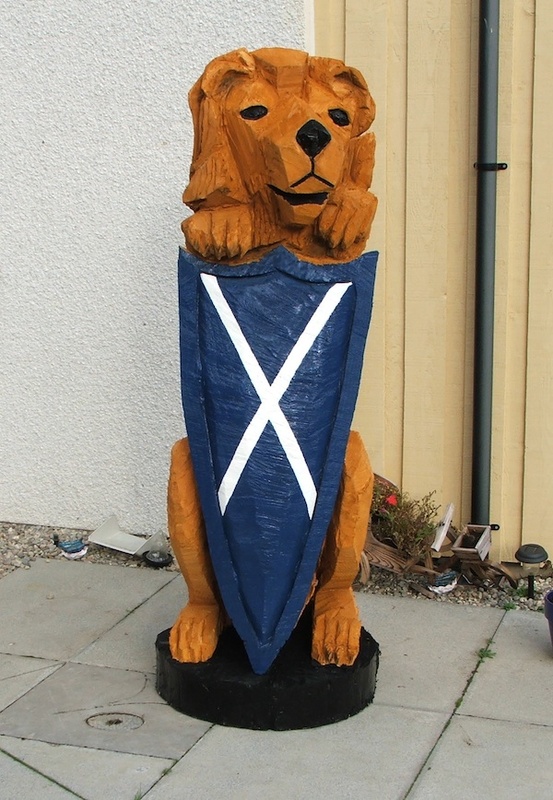 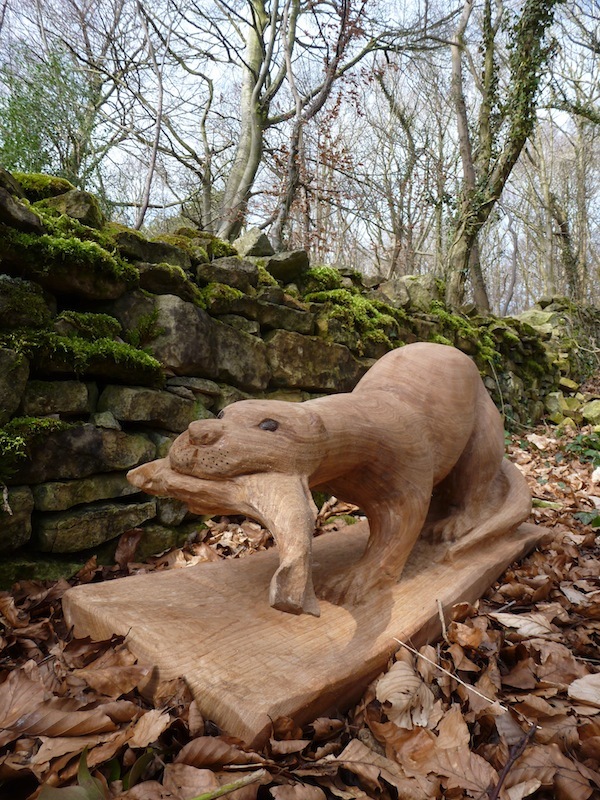 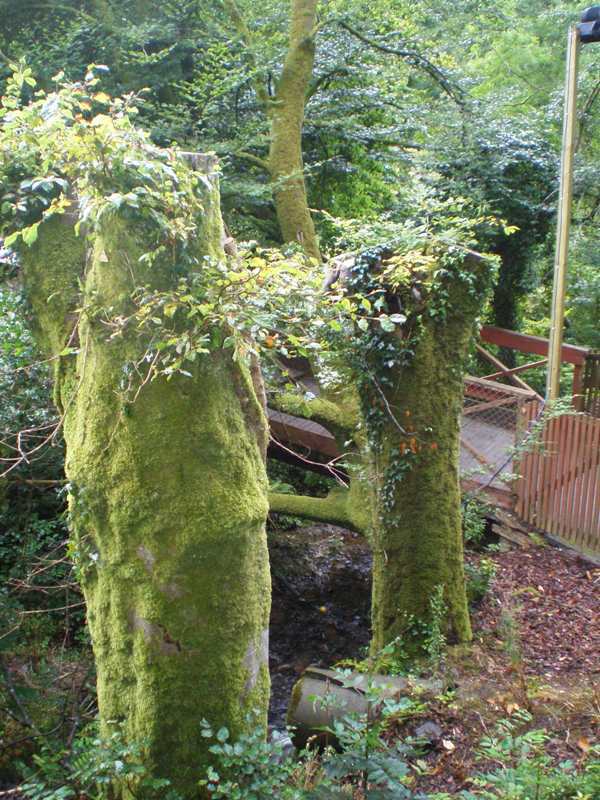 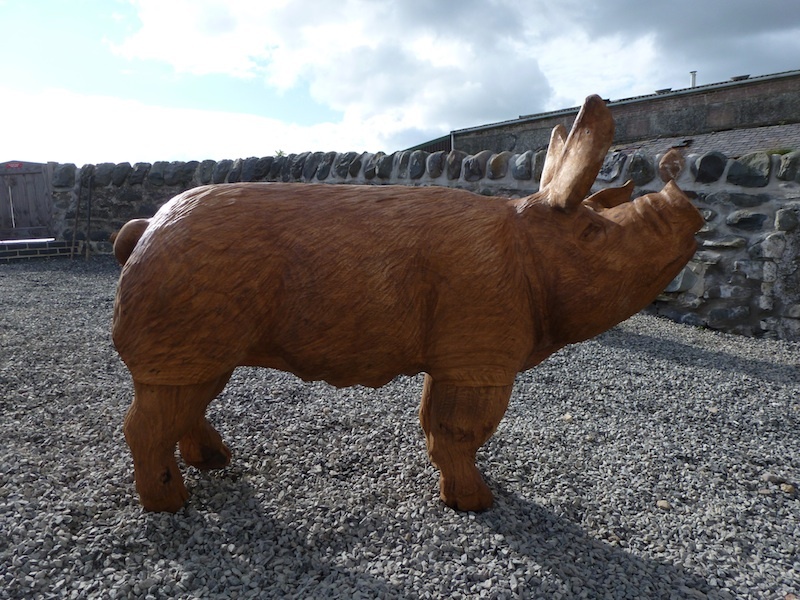 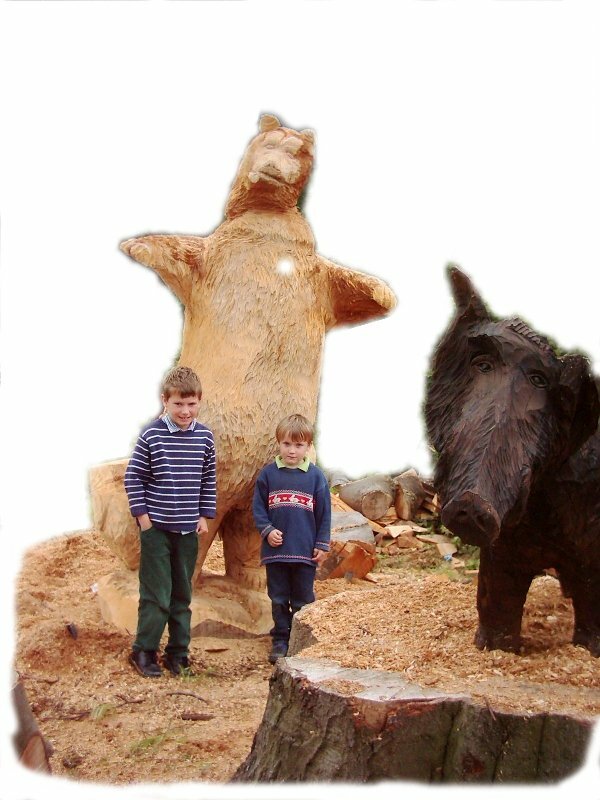 These bespoke life size chainsaw carvings are made out of oak and are placed in the gardens of Killantrae Burn Cottage which used to be an abattoir. 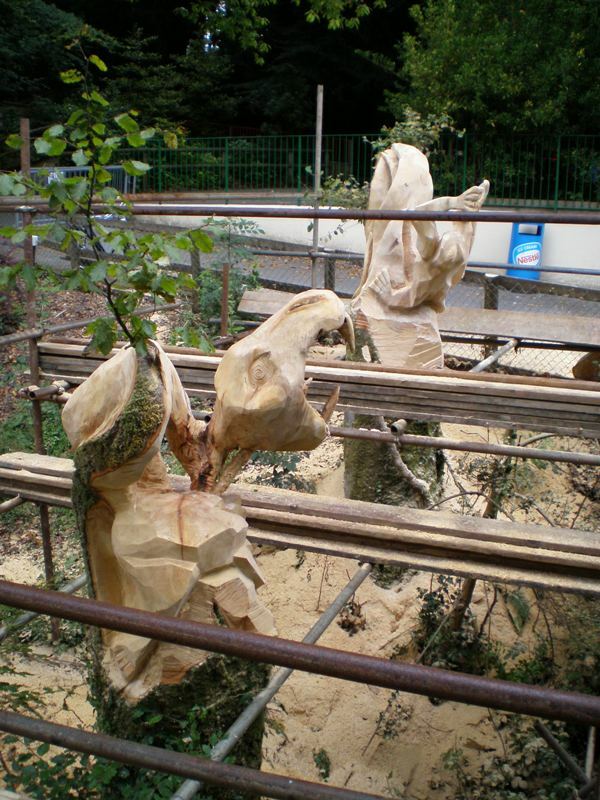 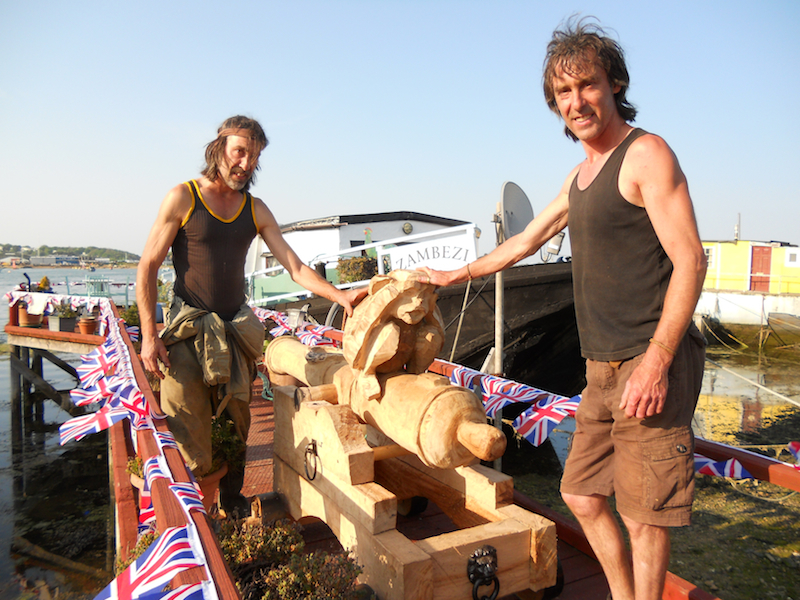 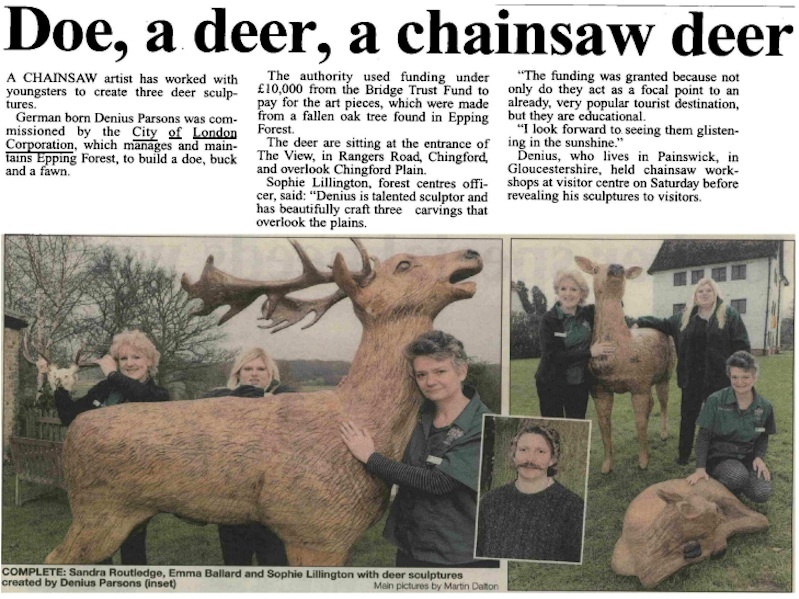 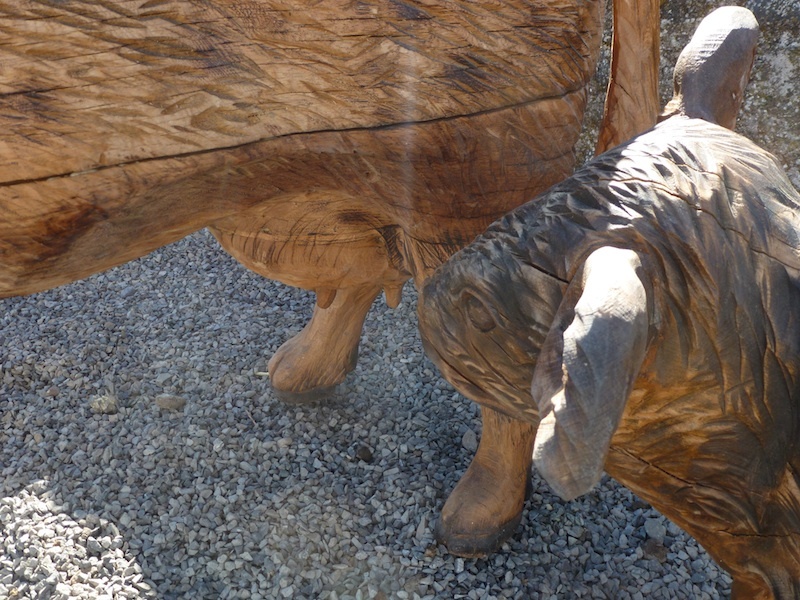 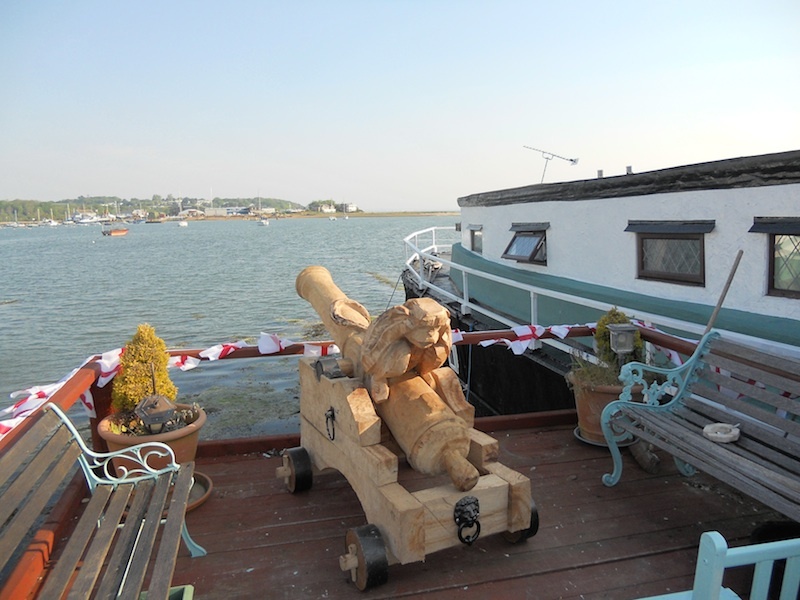 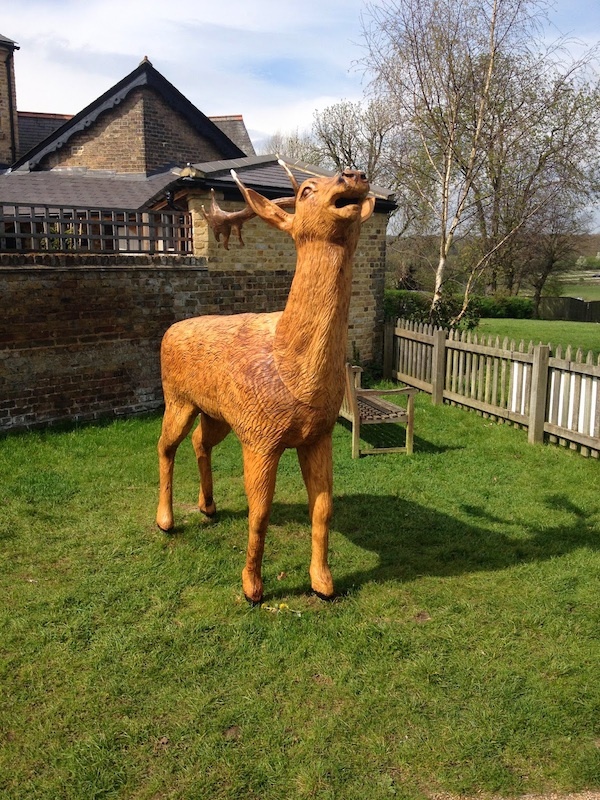 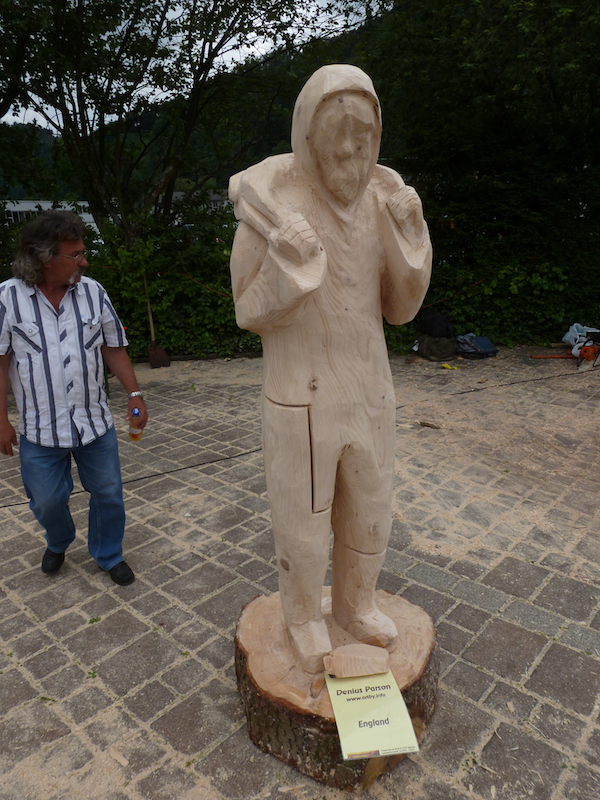 These chainsaw sculptures have lovingly become a tourist attraction in this small yet vibrant fishing village. 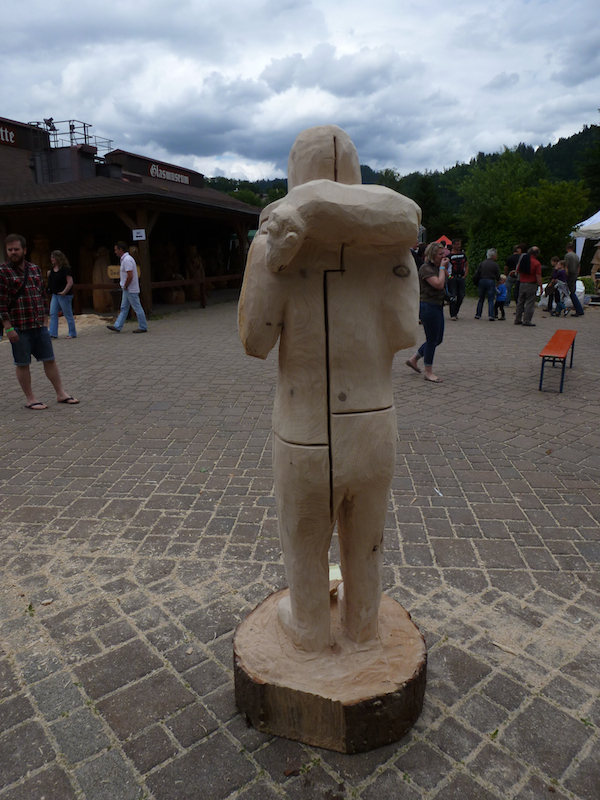 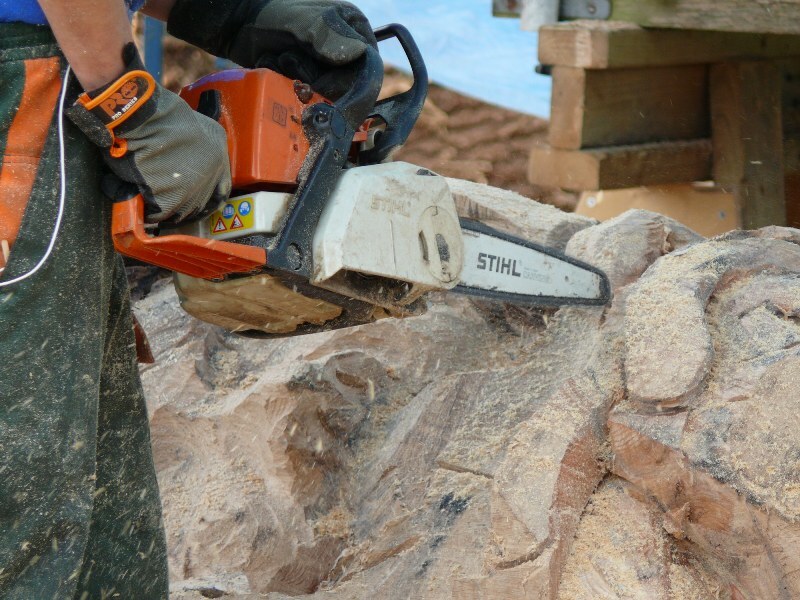 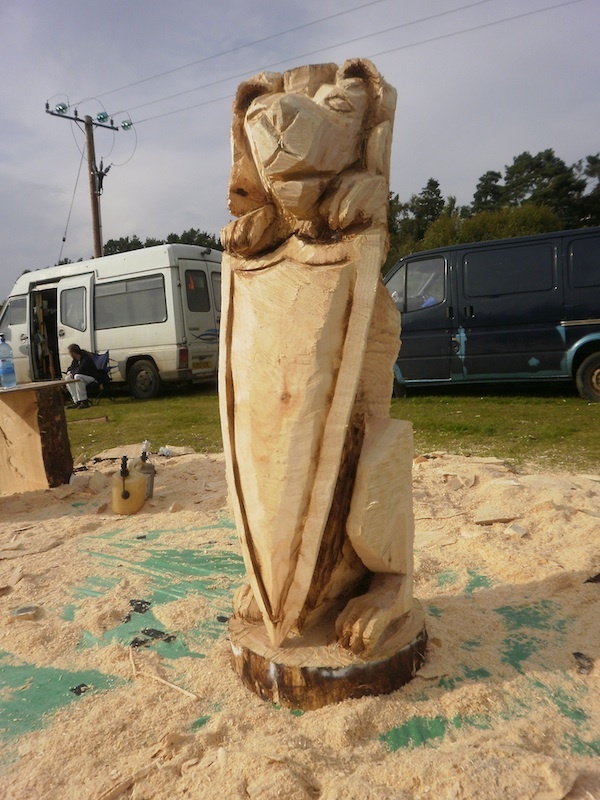 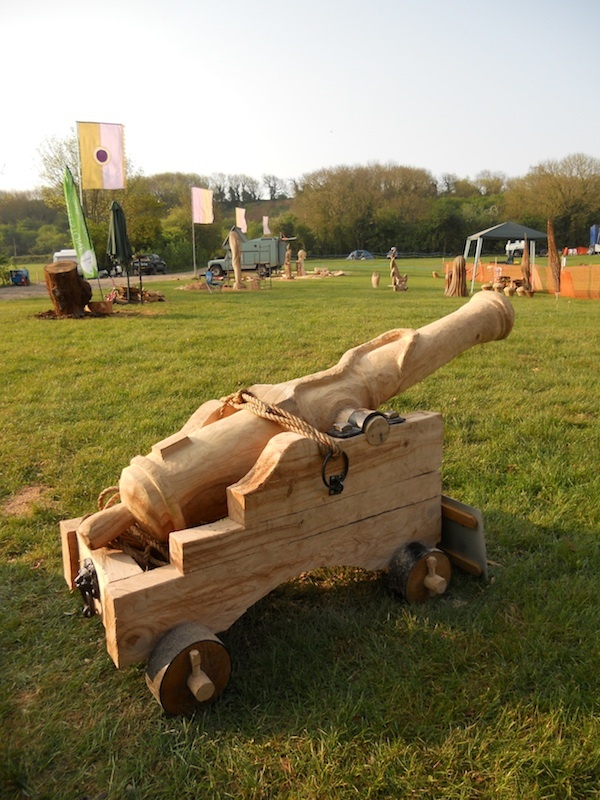 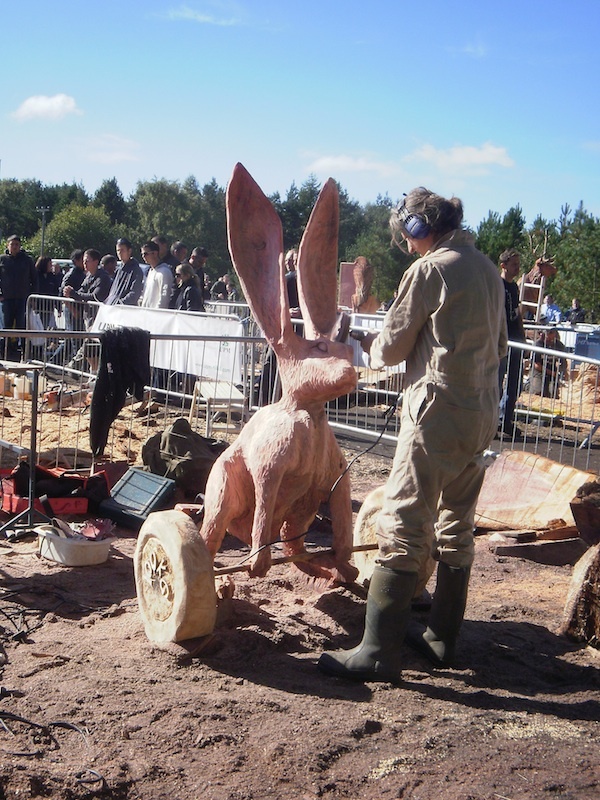 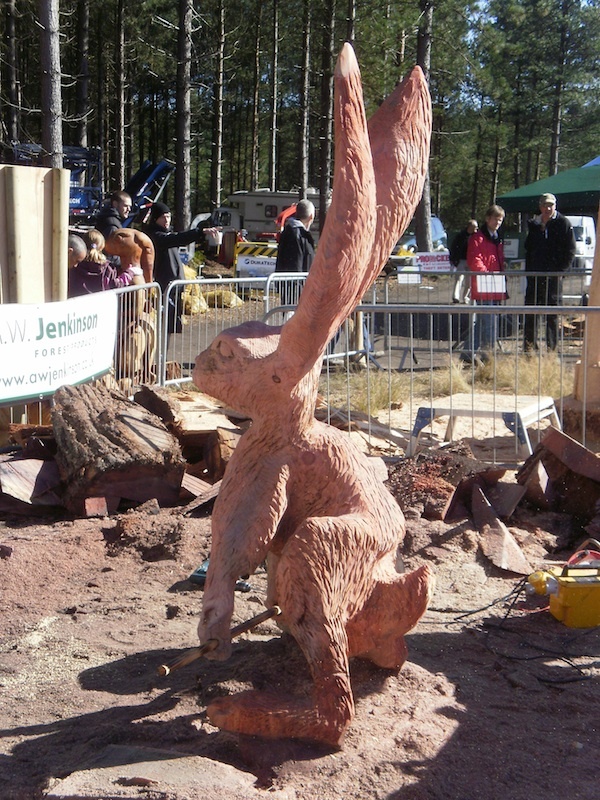 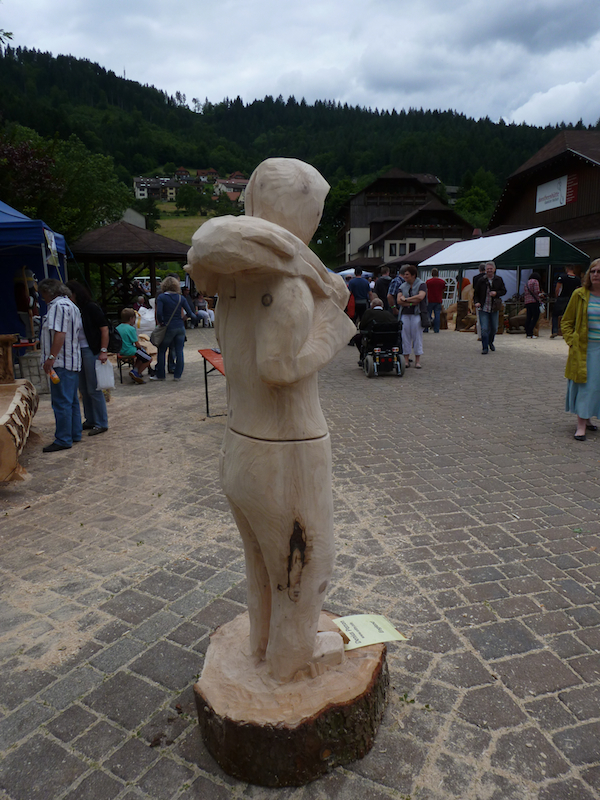 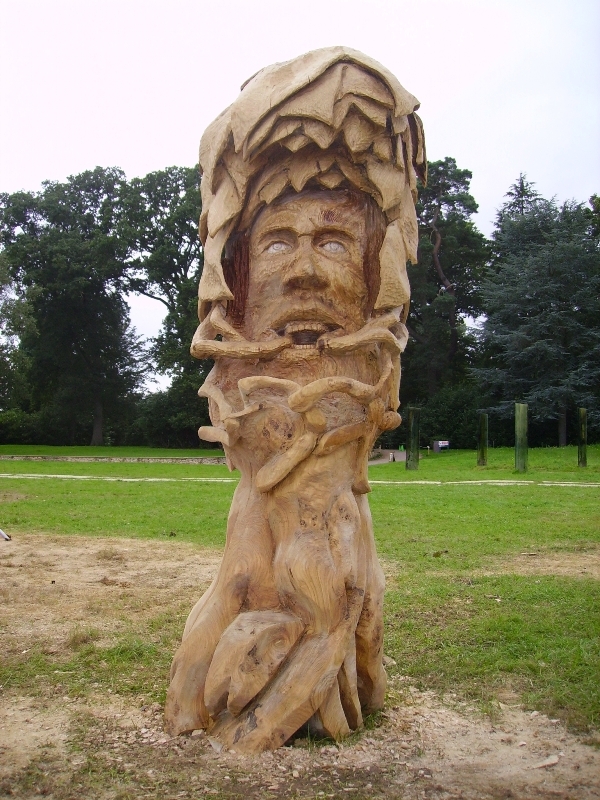 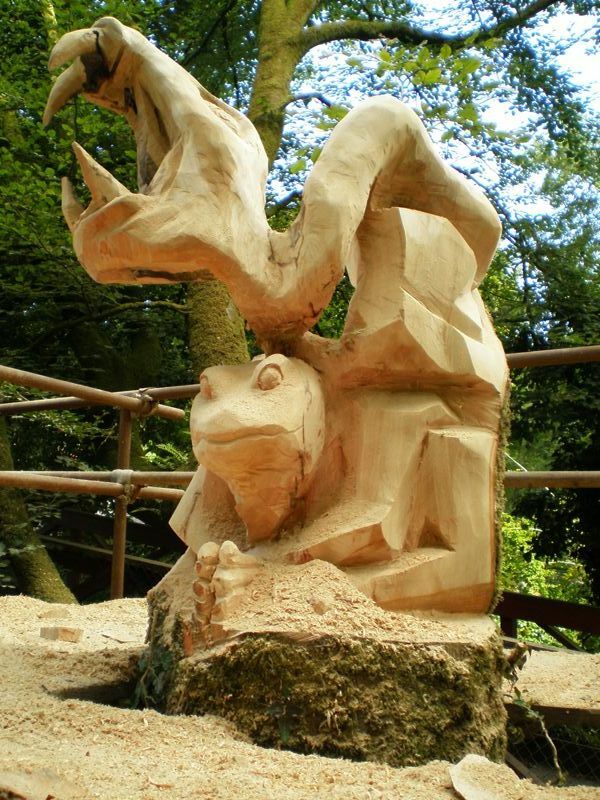 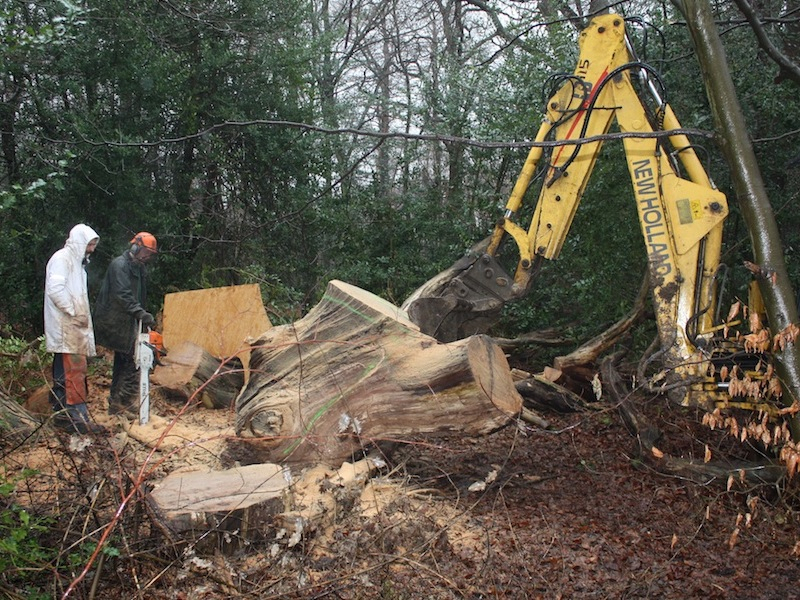 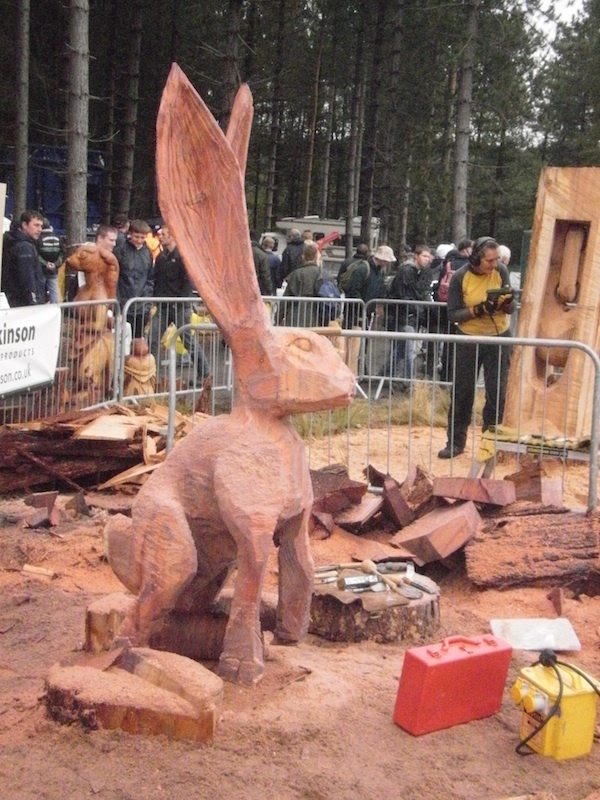 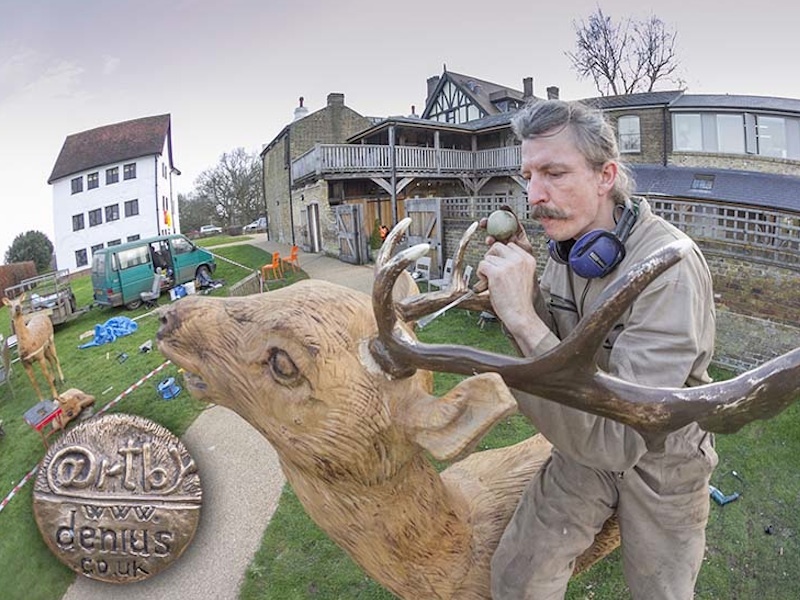 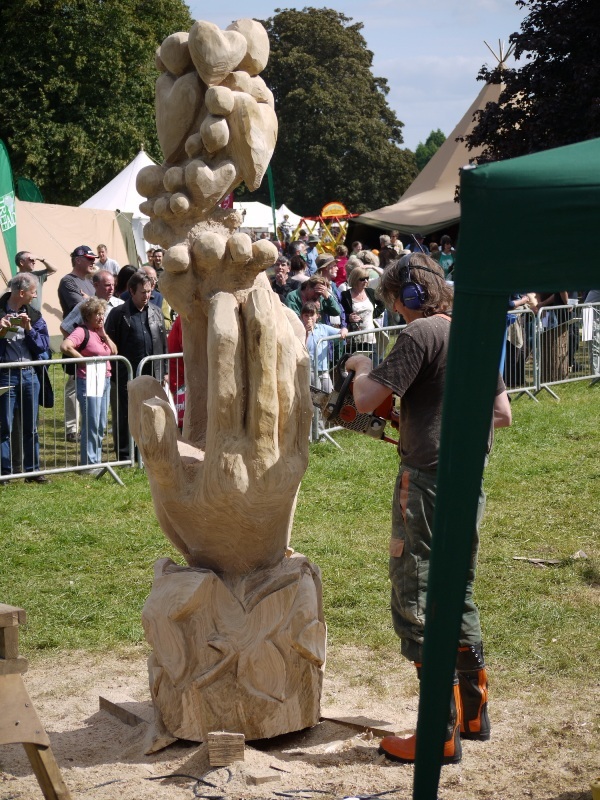 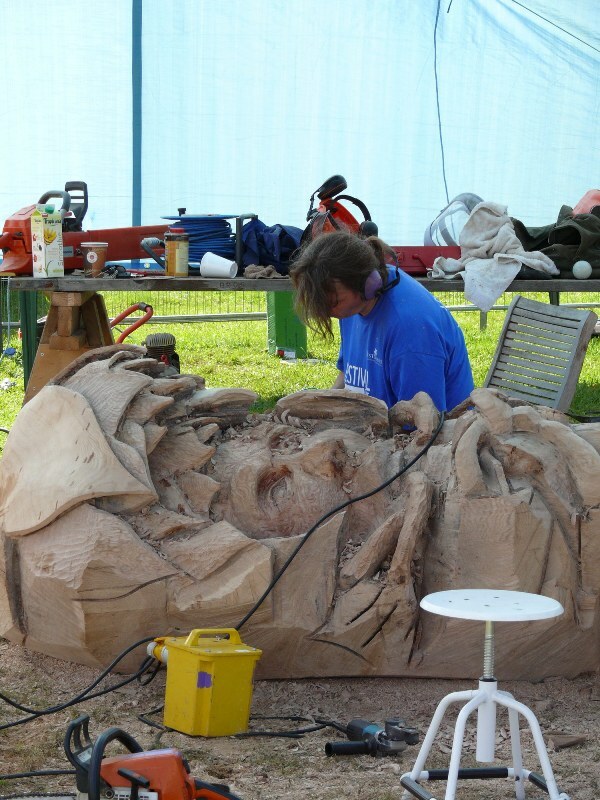 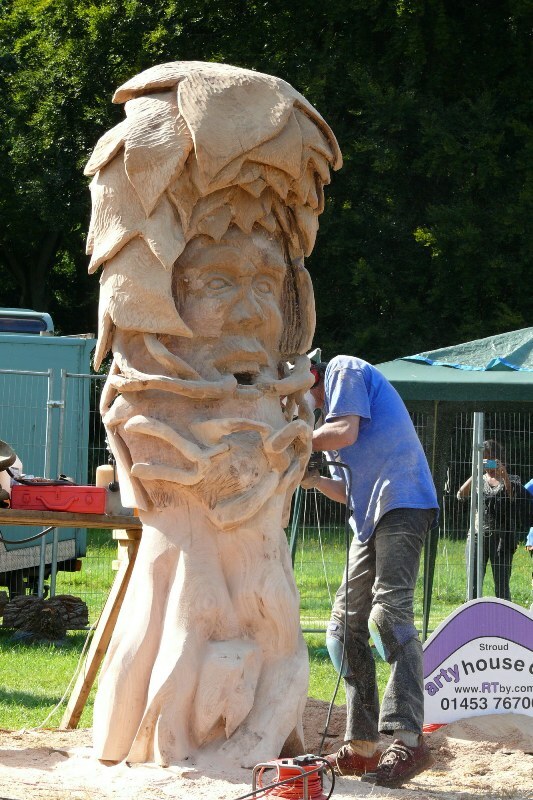 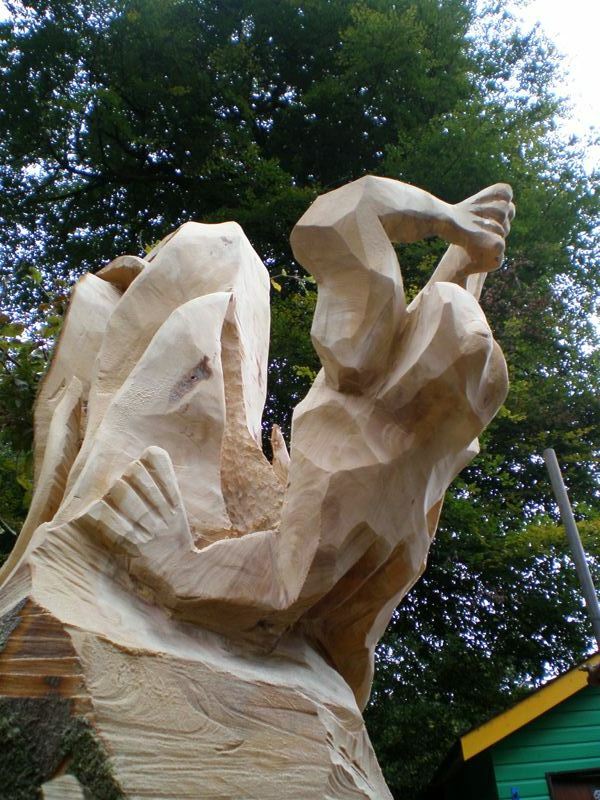 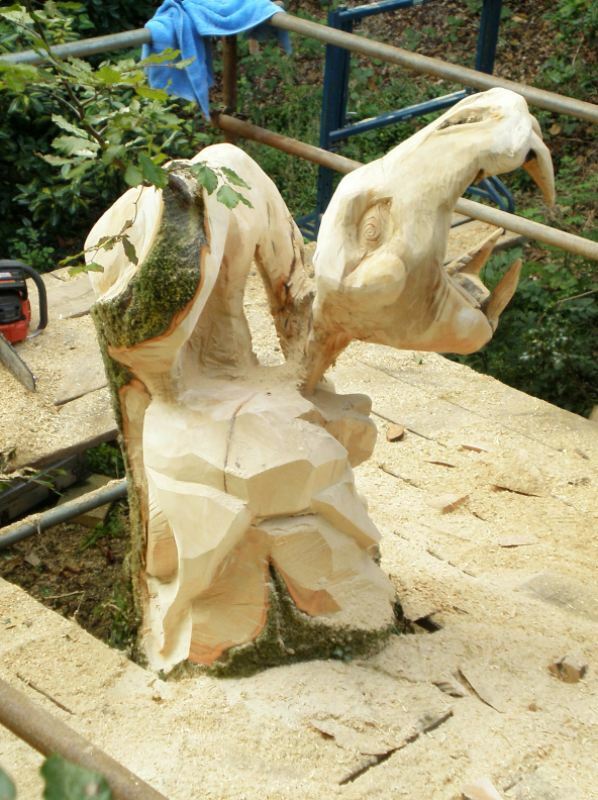 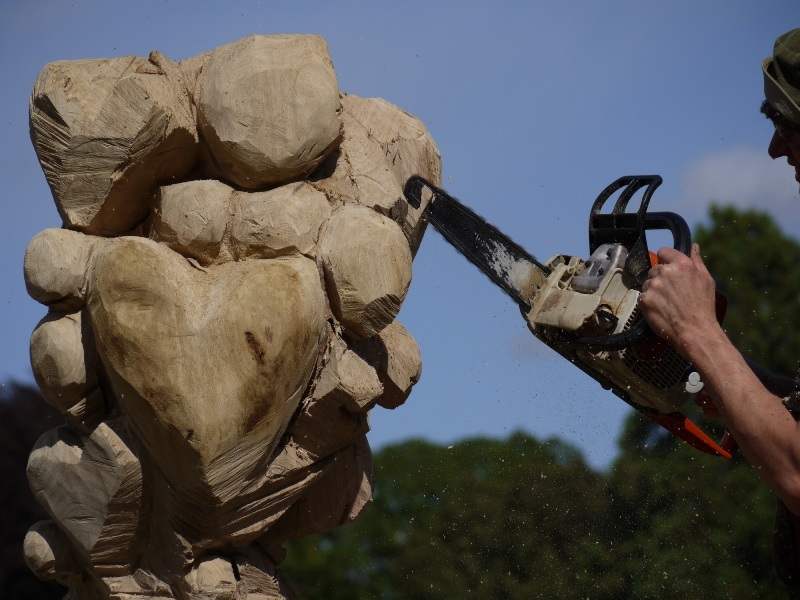 Every second year the event is held north of Birmingham.The European chainsaw carving championship it's organized by the APF. 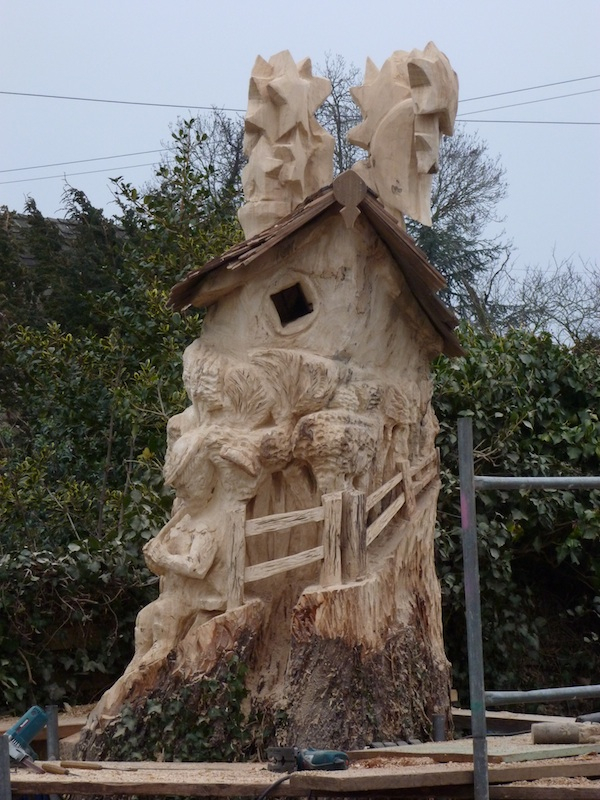 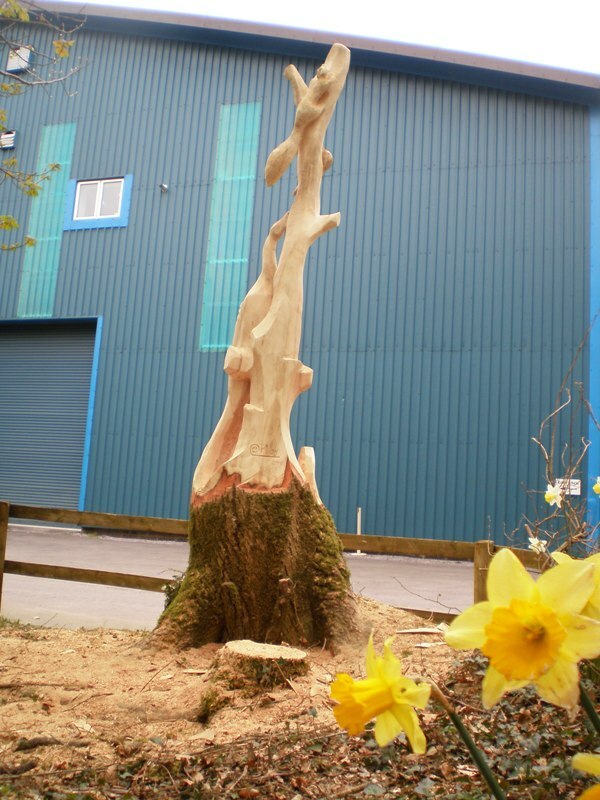 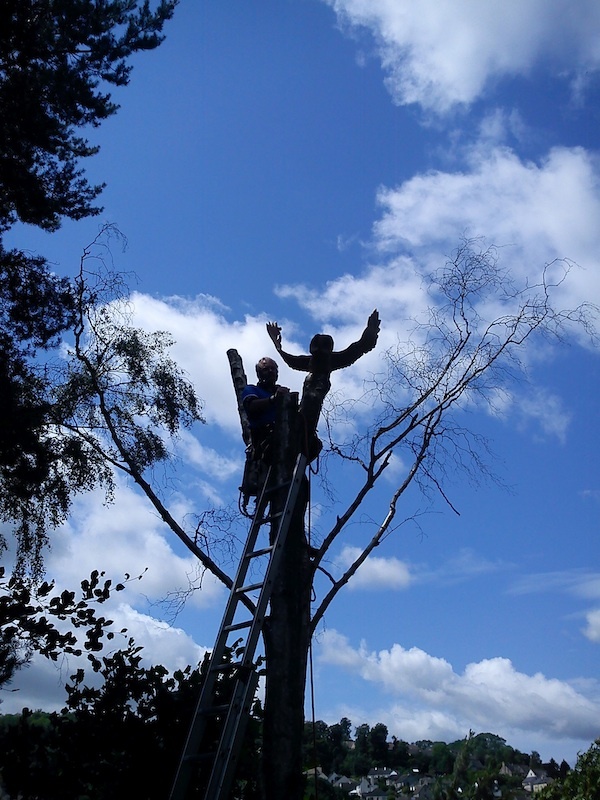 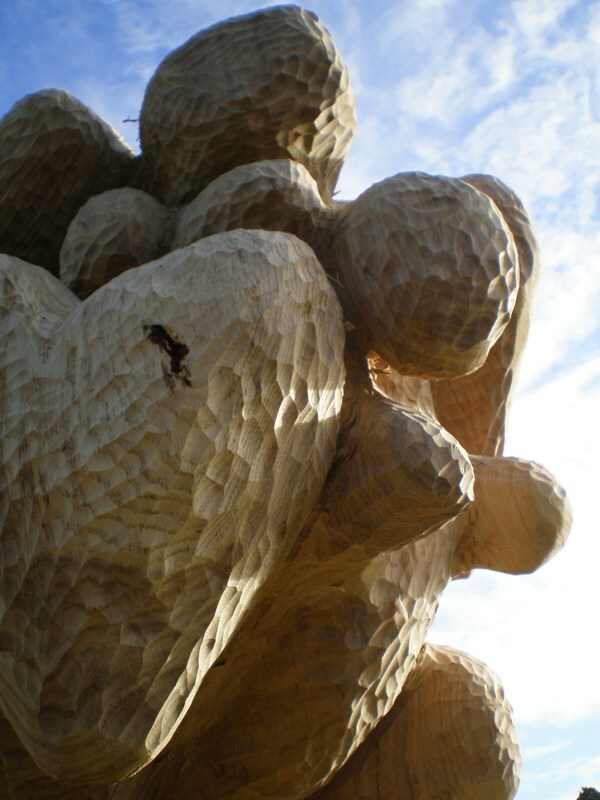 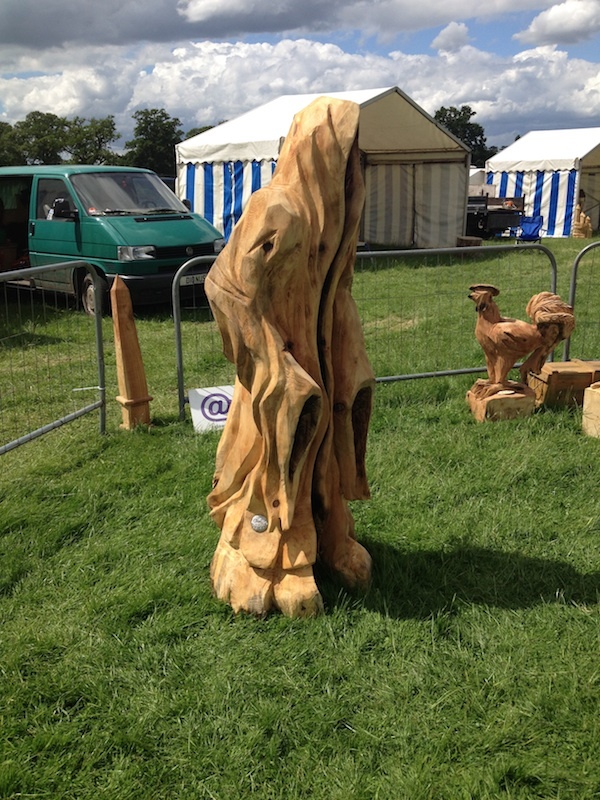 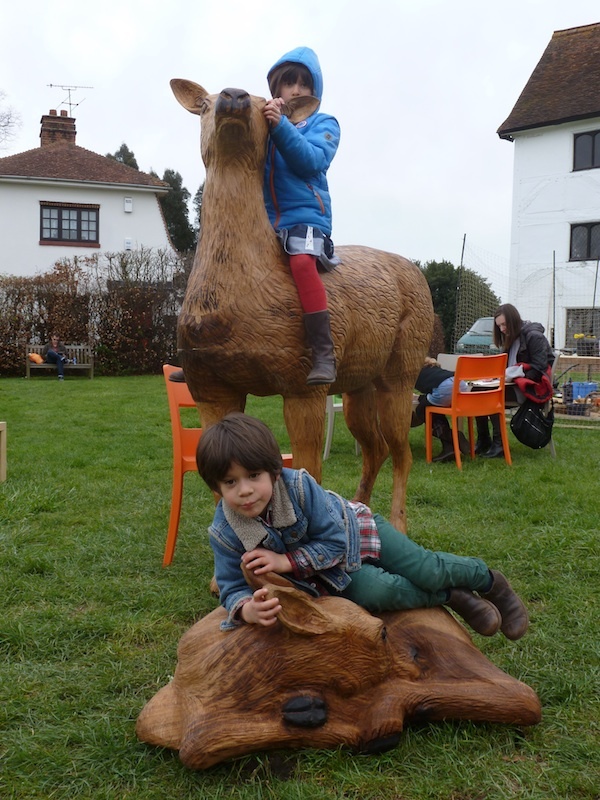 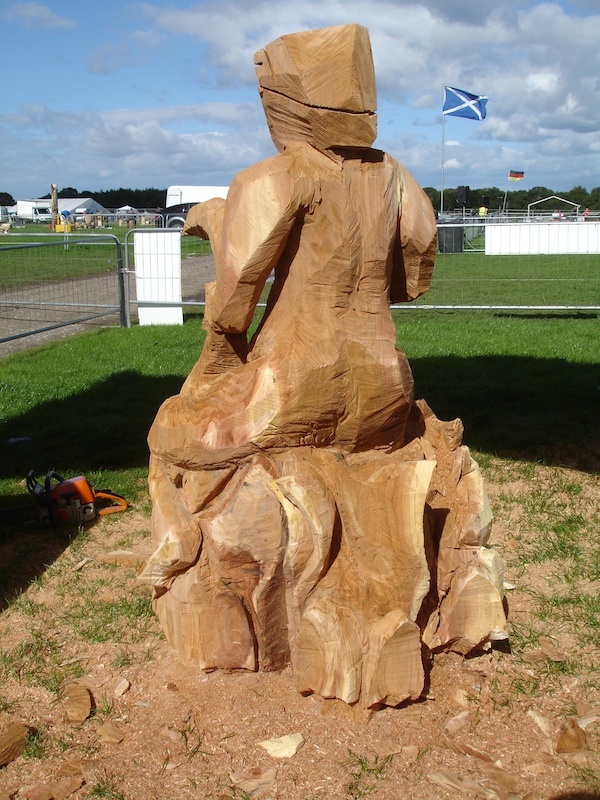 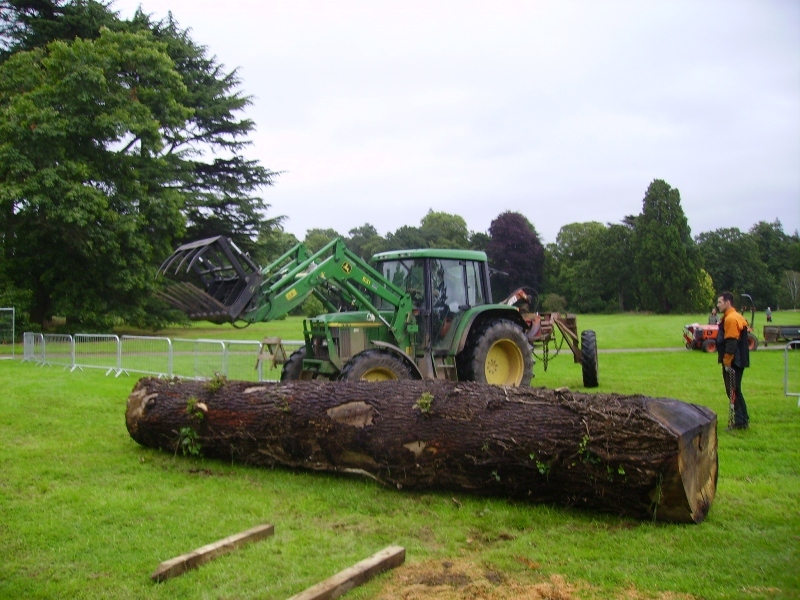 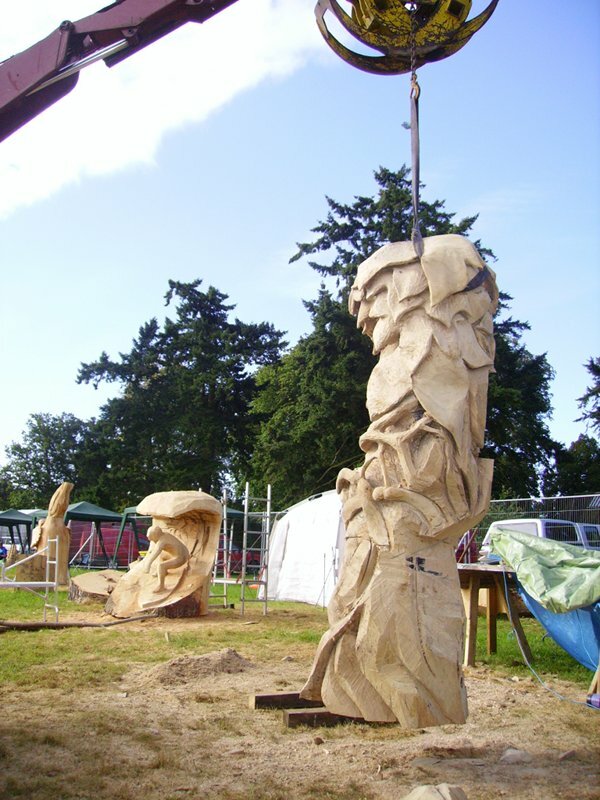 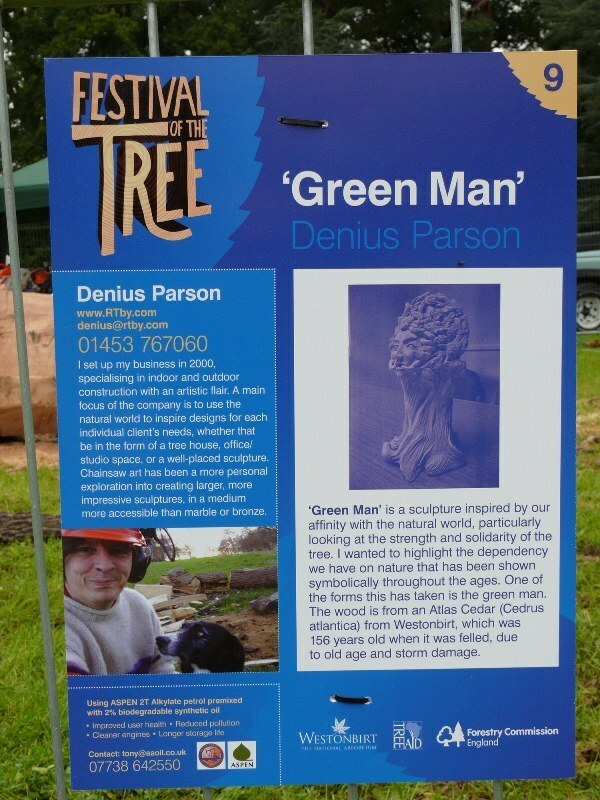 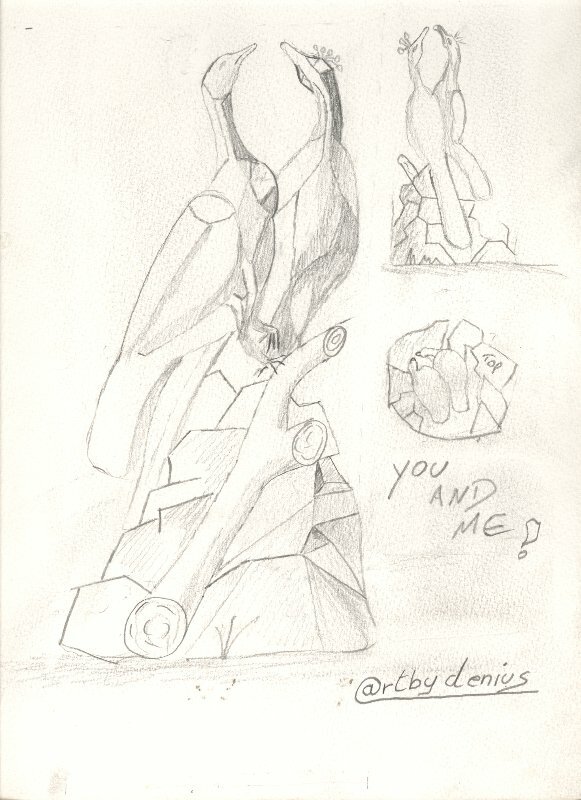 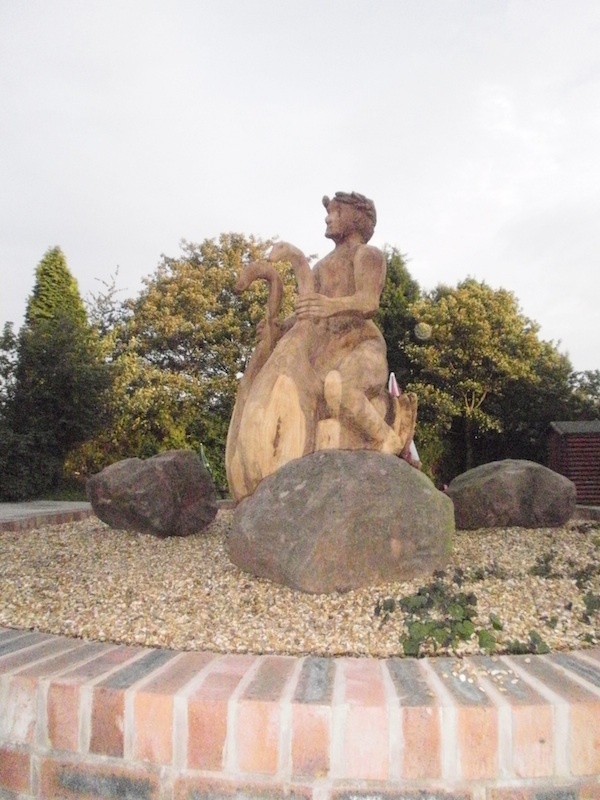 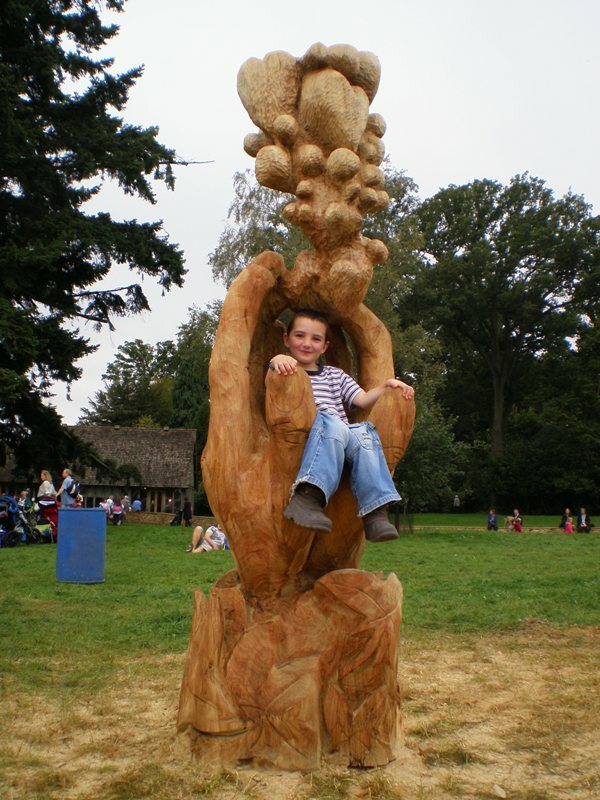 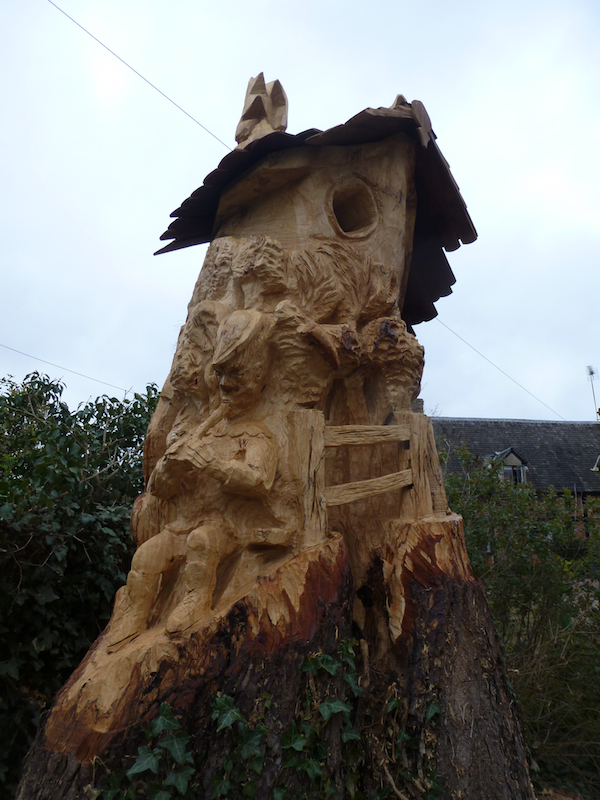 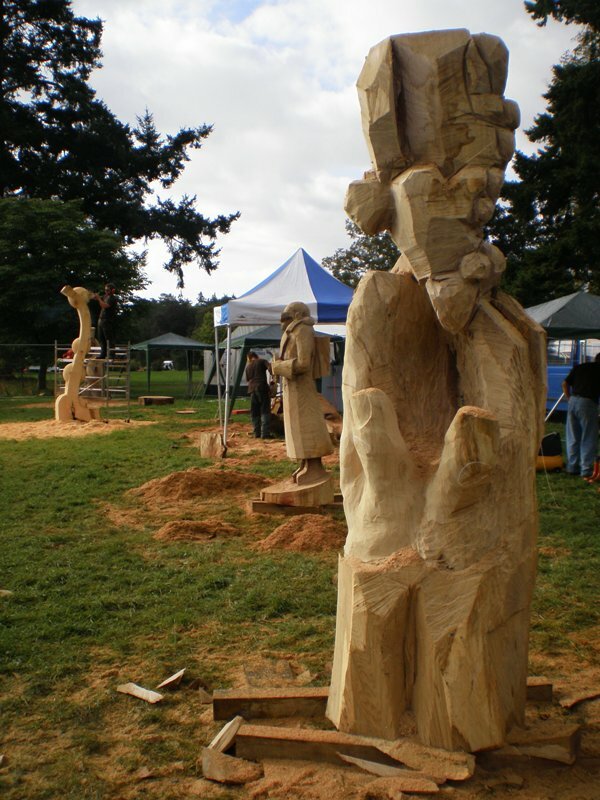 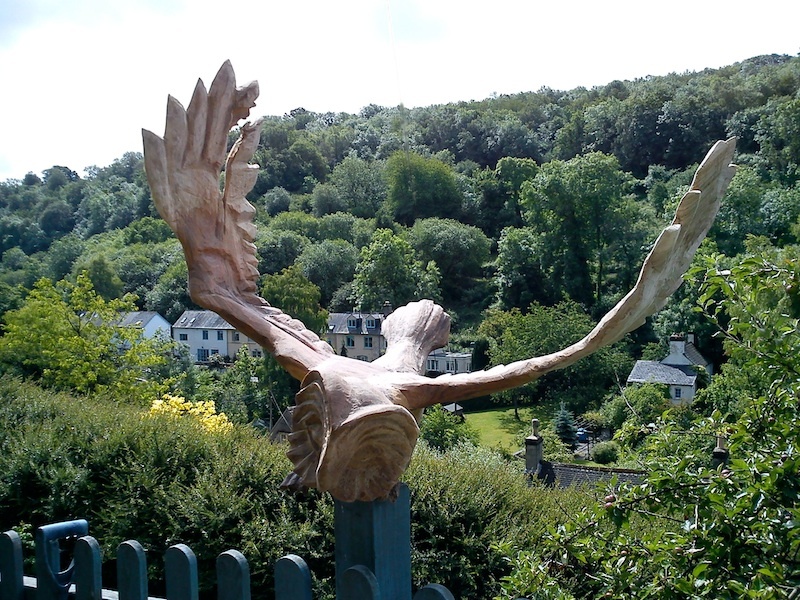 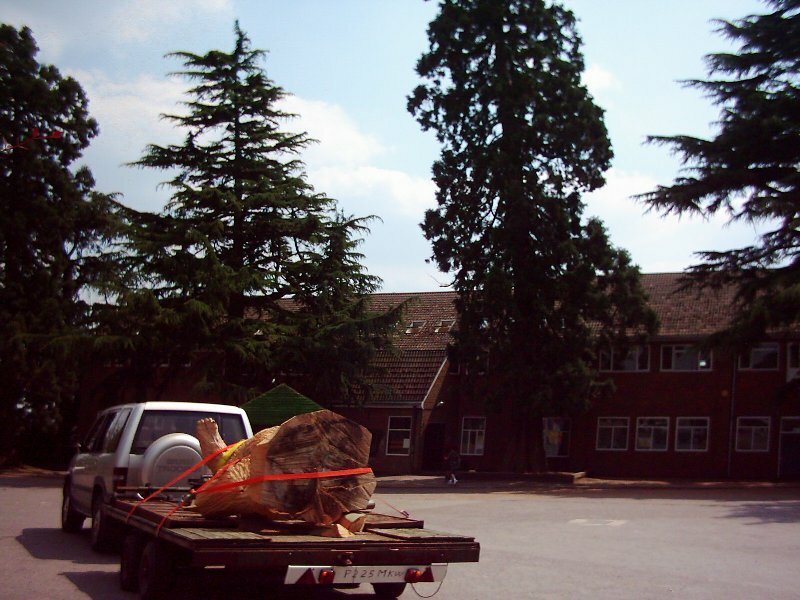 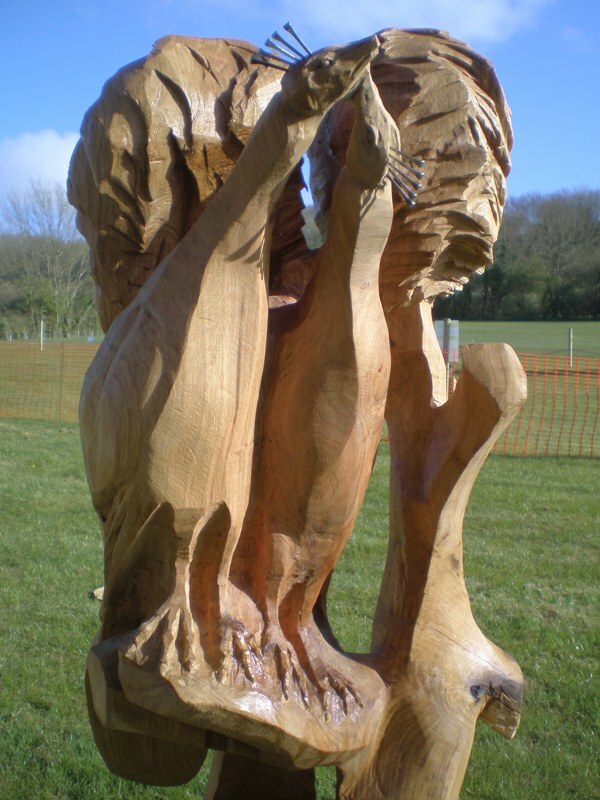 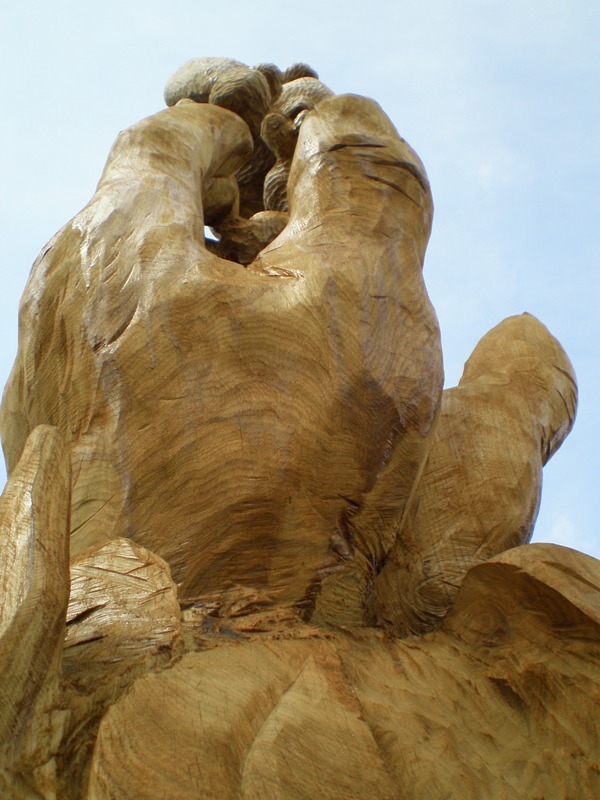 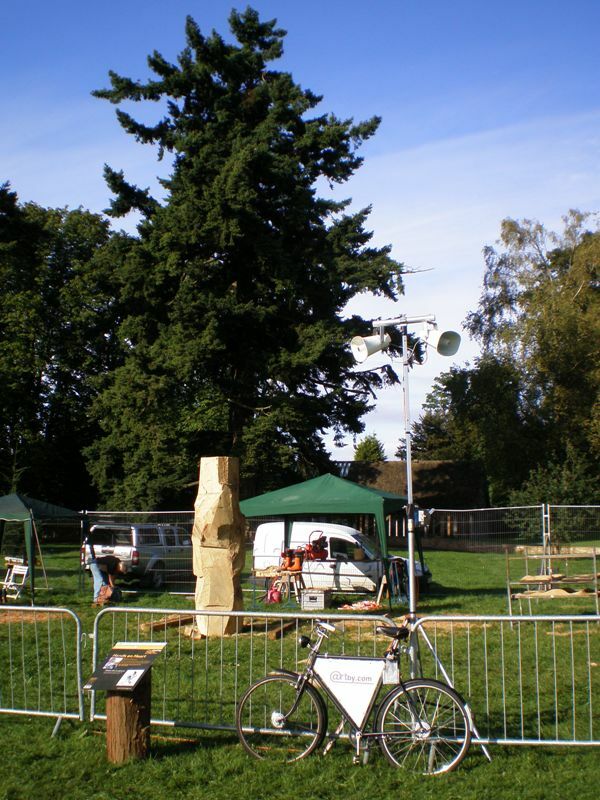 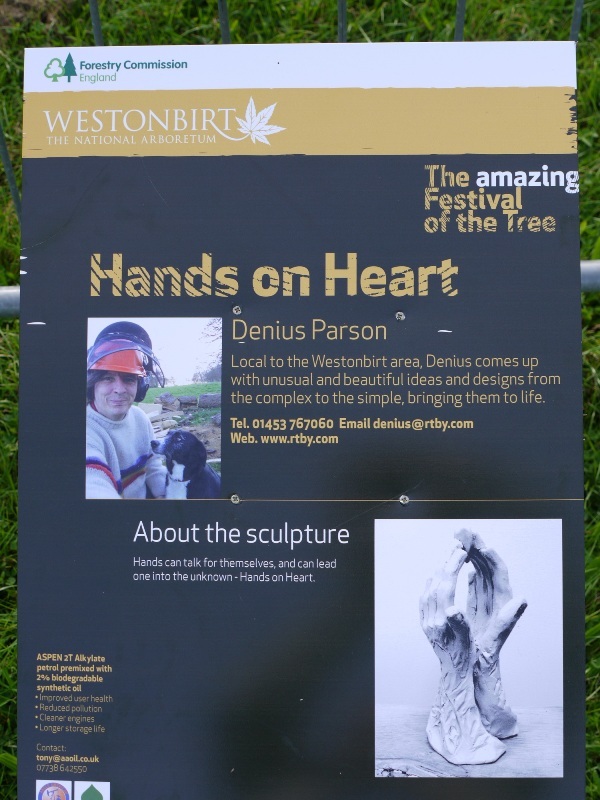 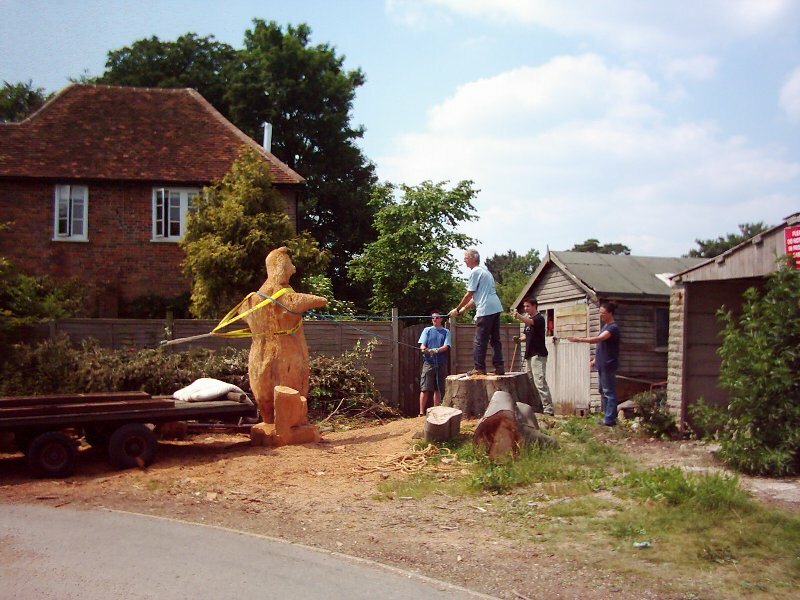 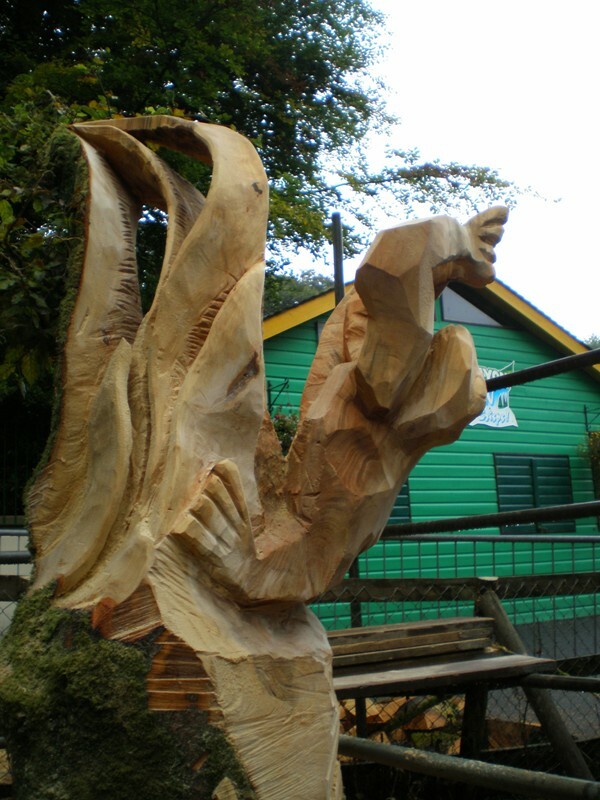 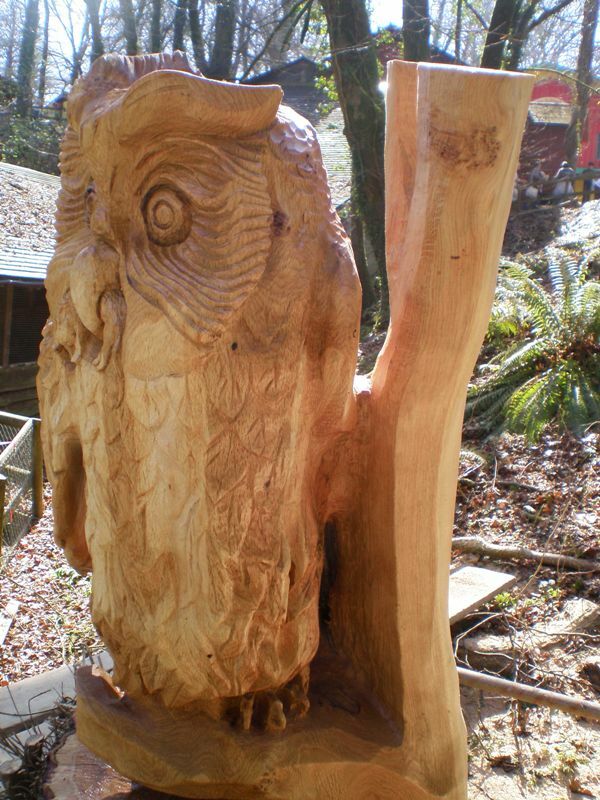 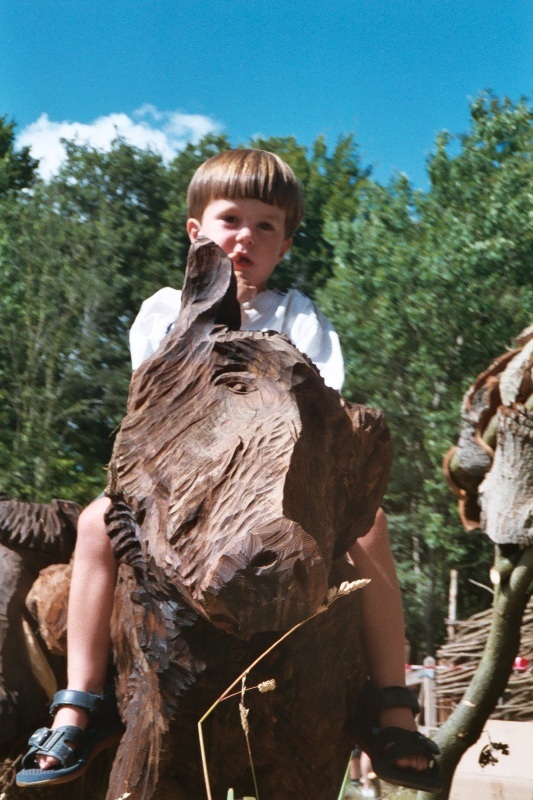 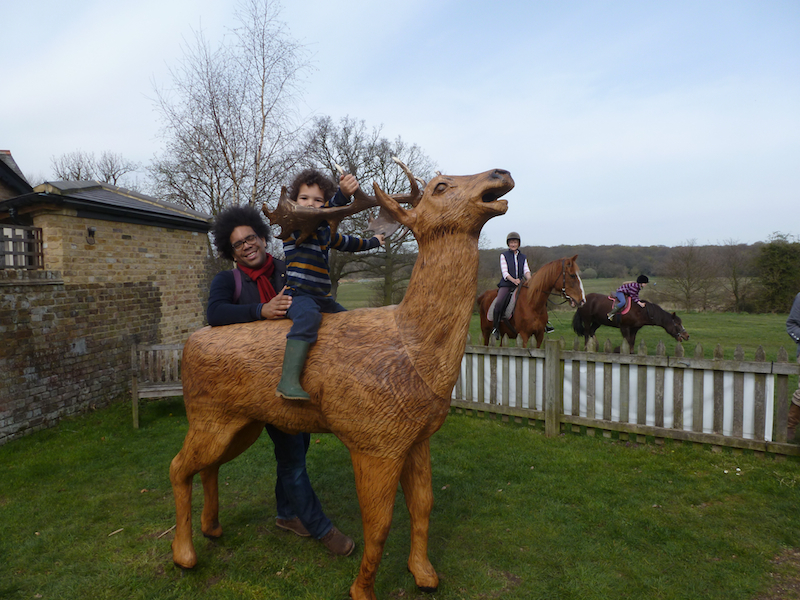 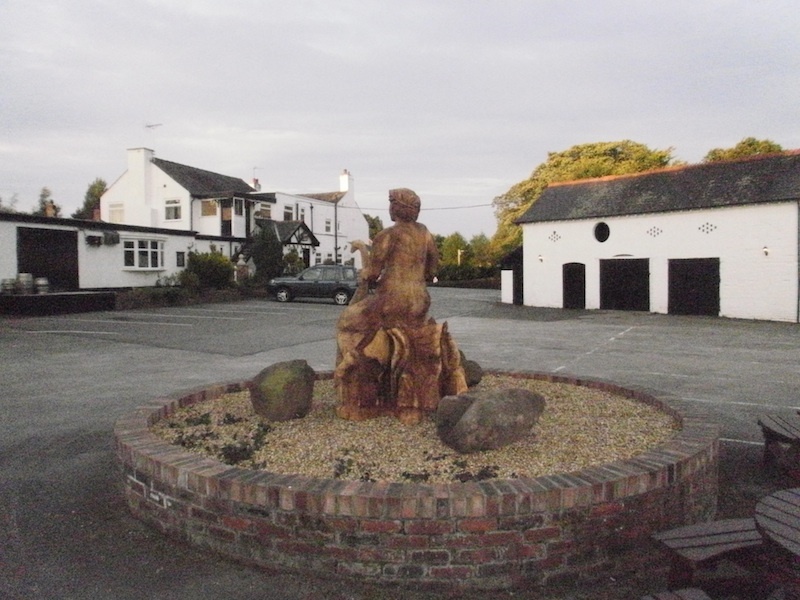 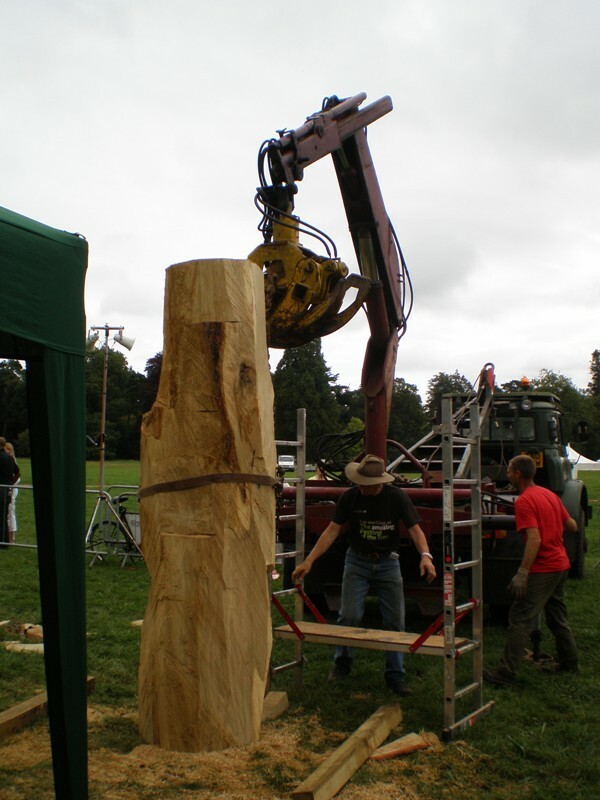 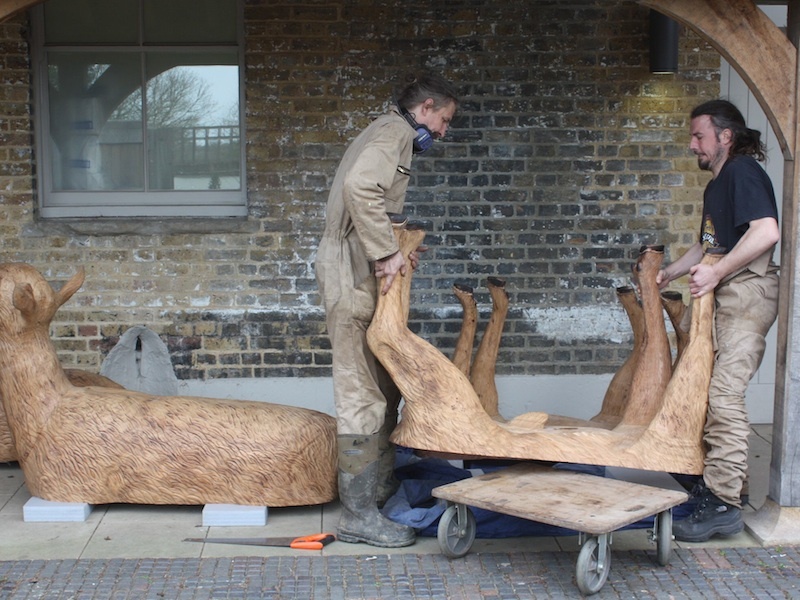 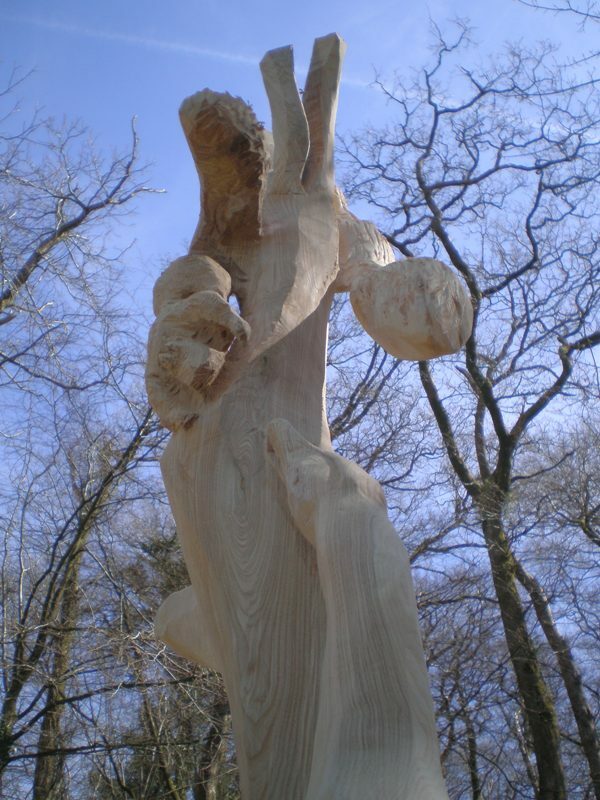 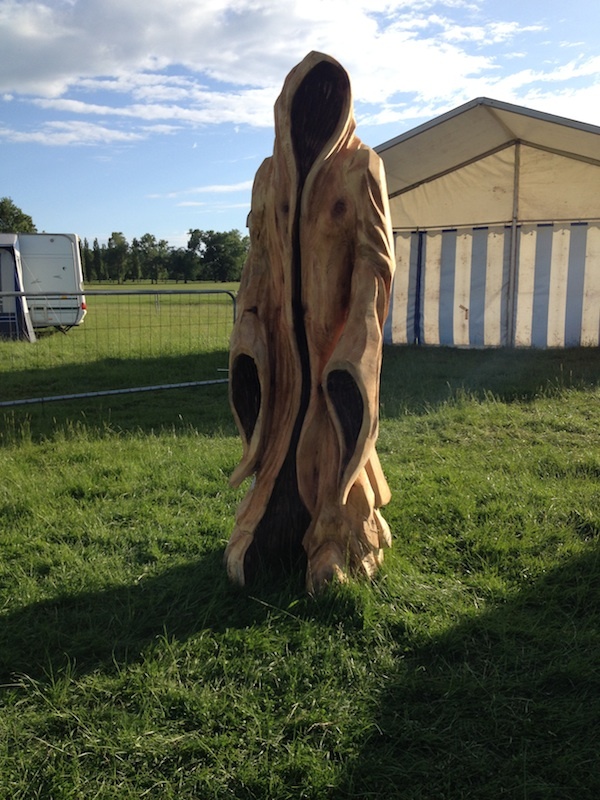 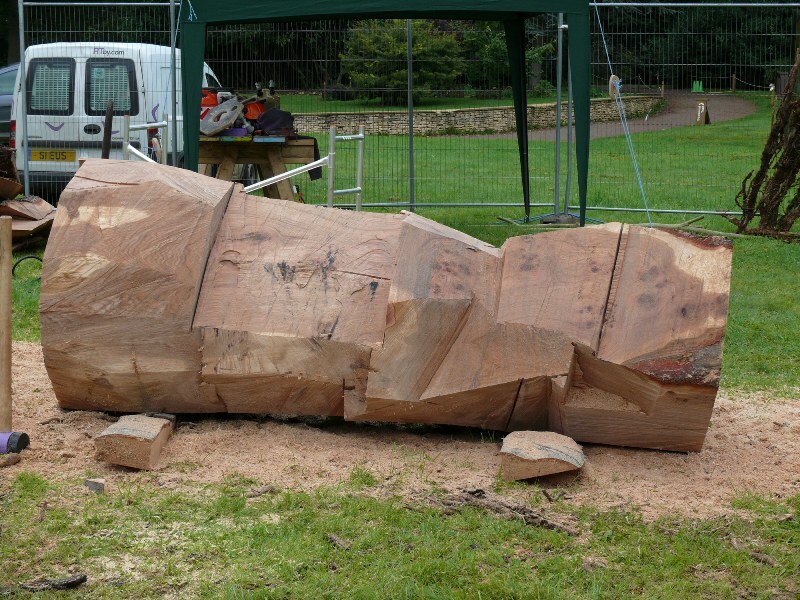 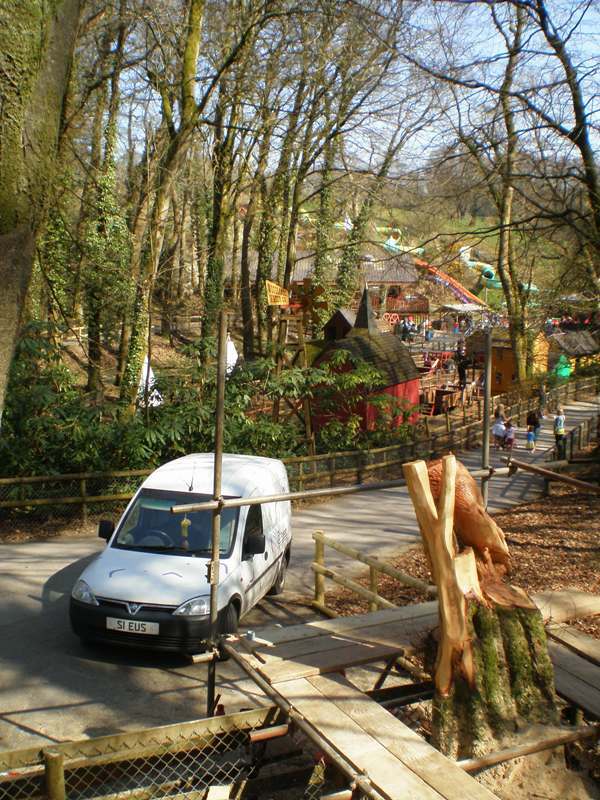 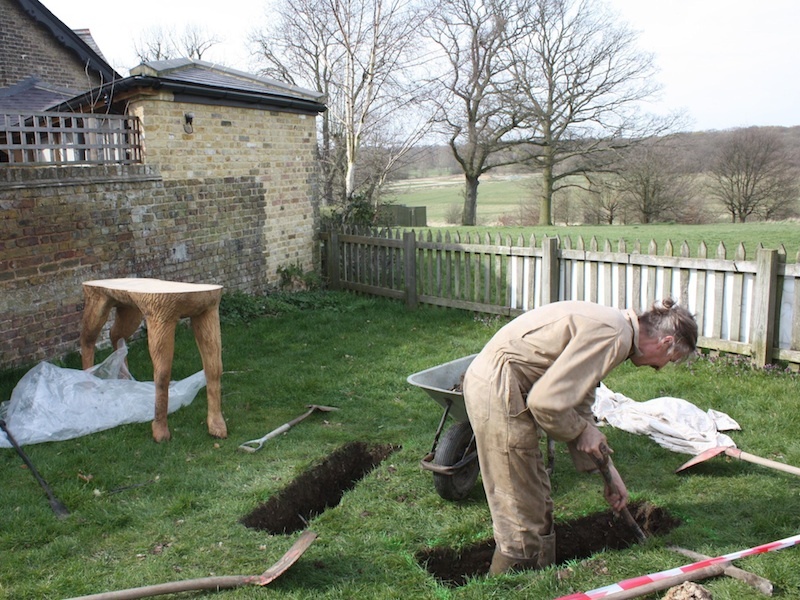 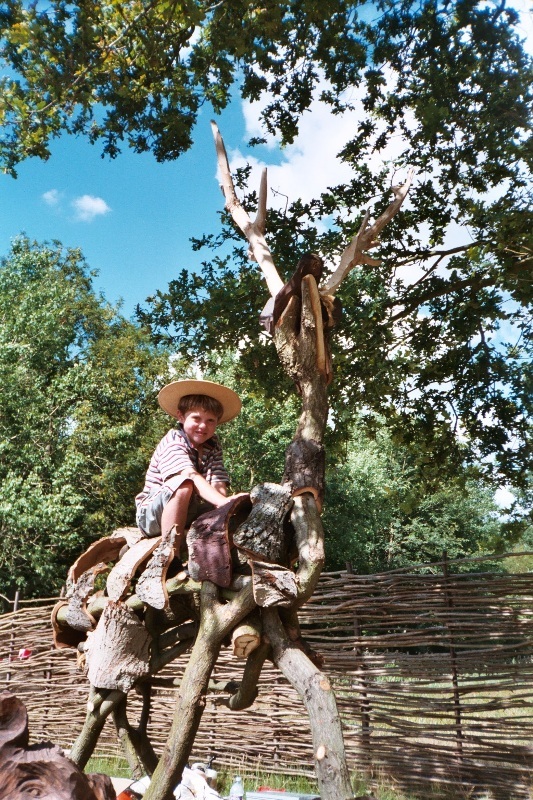 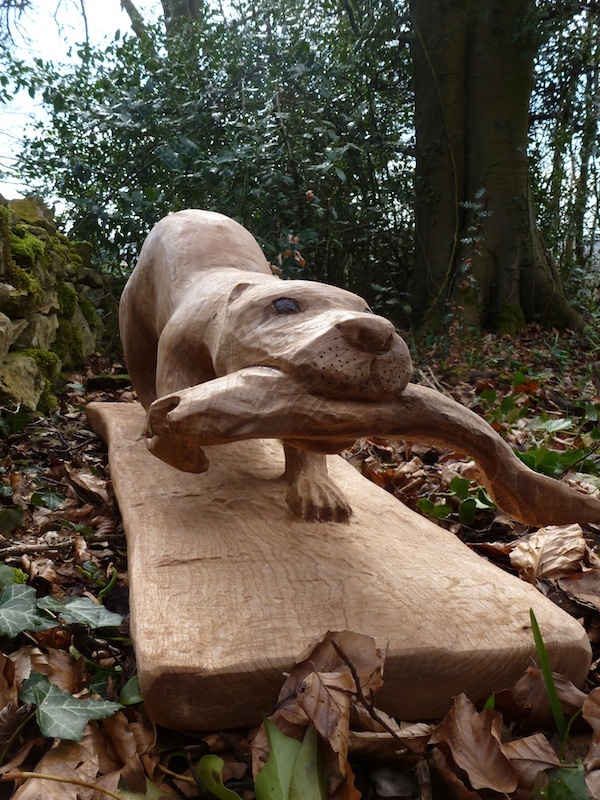 For the 25 sculptor's there is only redwood on offer 1m x 2m.The carving time was only twenty hour's. 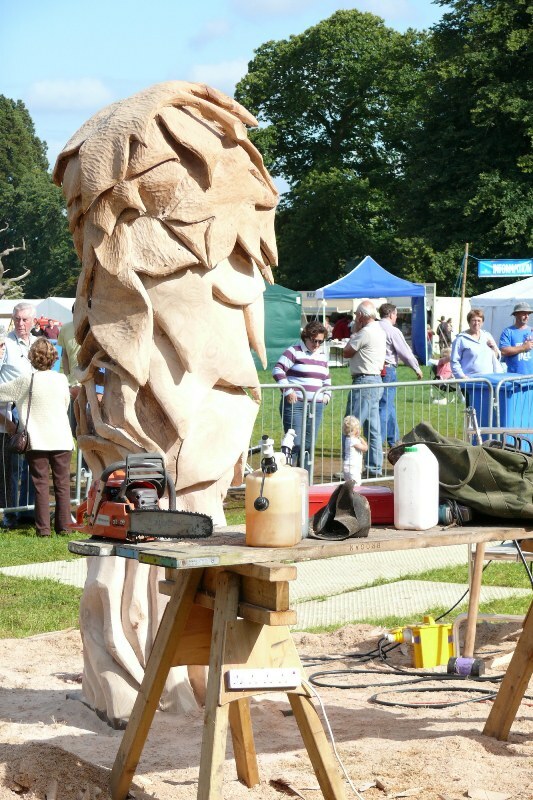 The English Open Chainsaw Competition - Held at Cheshire Game & Country Fair August Bank Holiday 28th,29th and 30th 2010. 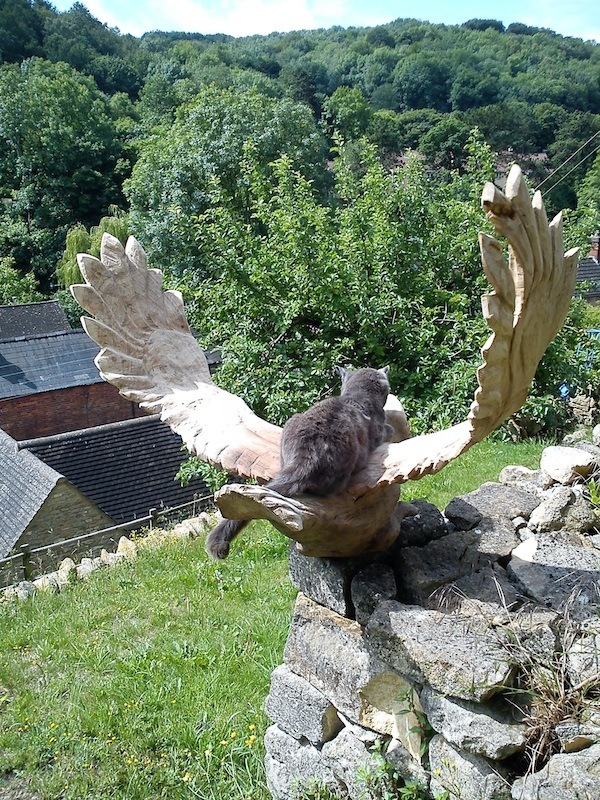 The guard of the swan world! 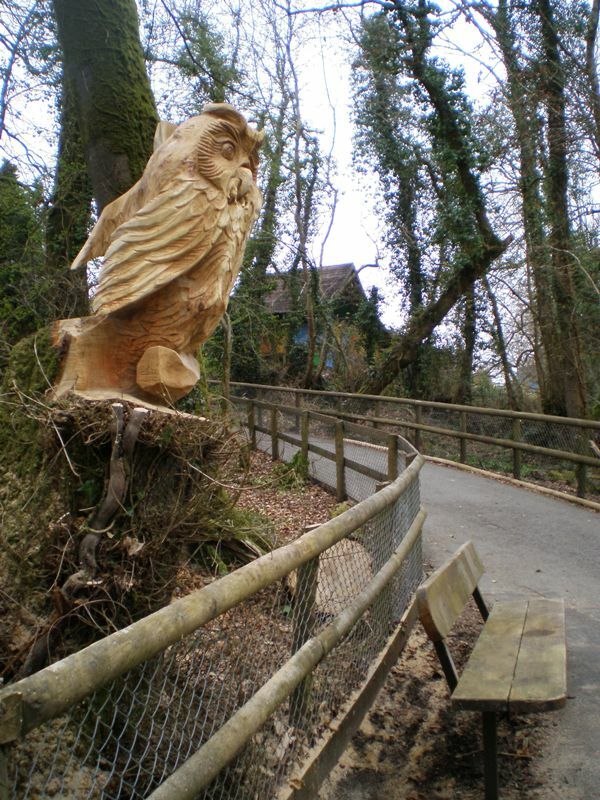 The owl has just landed and is about to munch her snack! 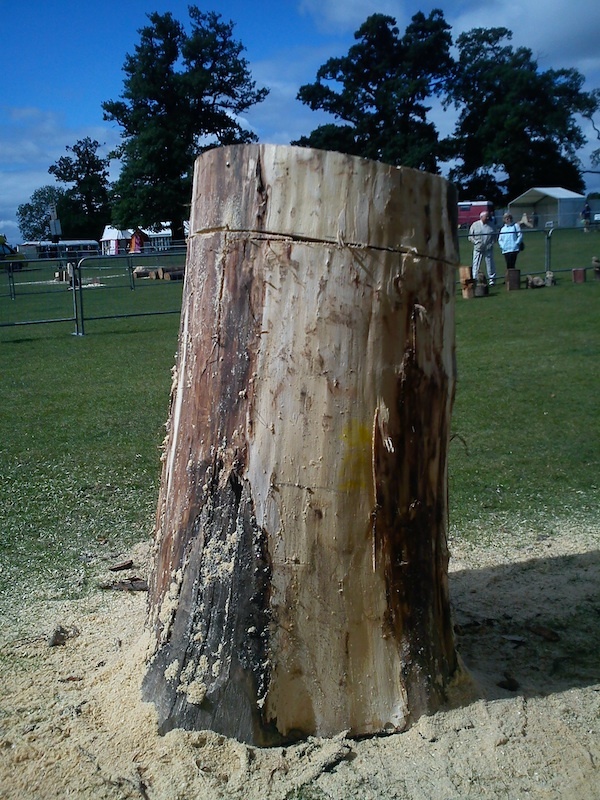 After thinking long and hard that was the best solution for this oak stump peering over a bench where walkers might be taking a hard earned rest and eating their snacks too. 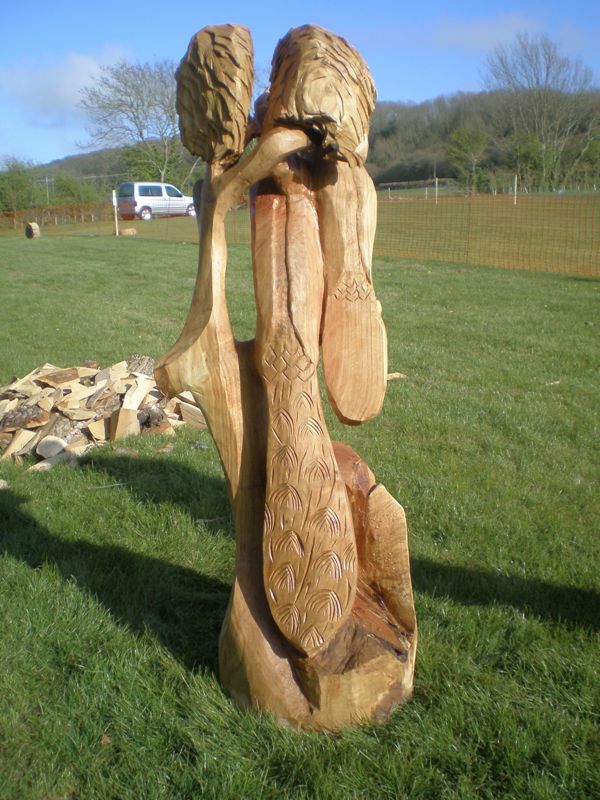 The owner requested something natural and taking a moments thought to watch the peacocks strutting boldly around gave me the obvious inspiration for this lonely ash tree, a particularly bolshy peacock having a domestic with some squirrels. 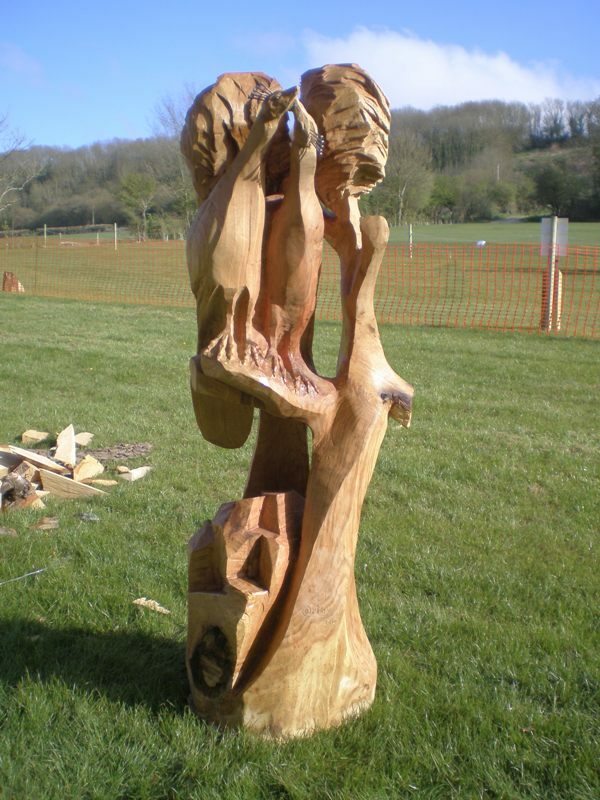 The first of my chainsaw art commissions turned out rather well. 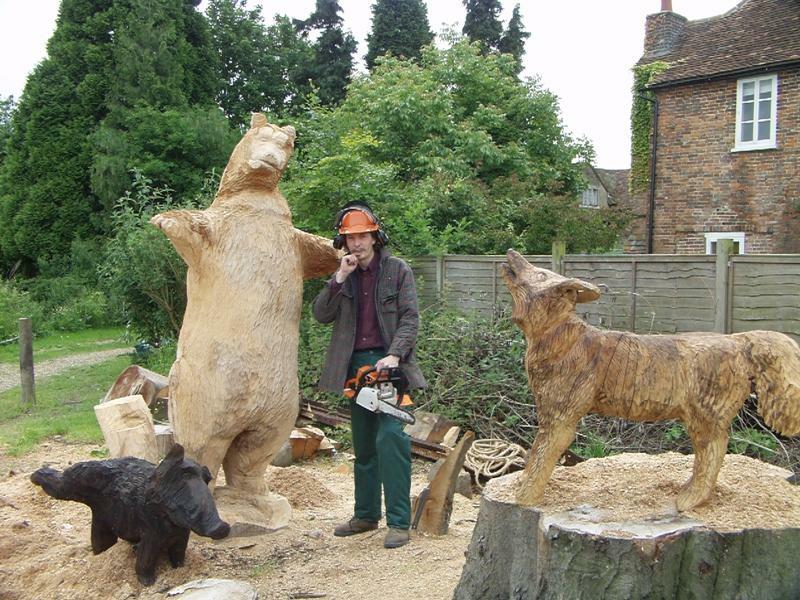 One giant bear and 4 smaller sculptures created for Celtic Harmony Camp. 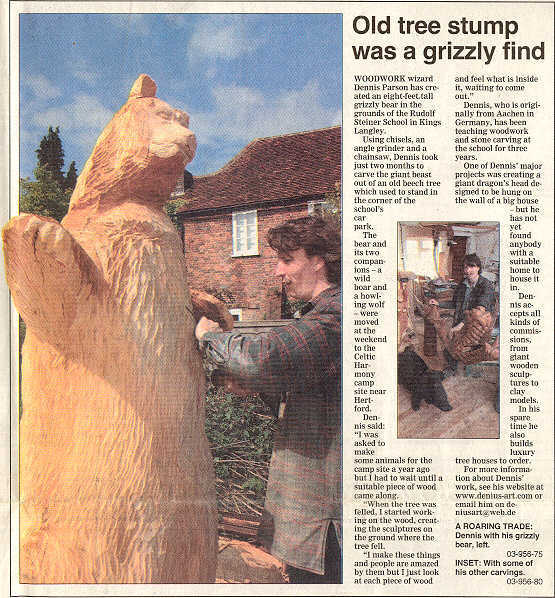 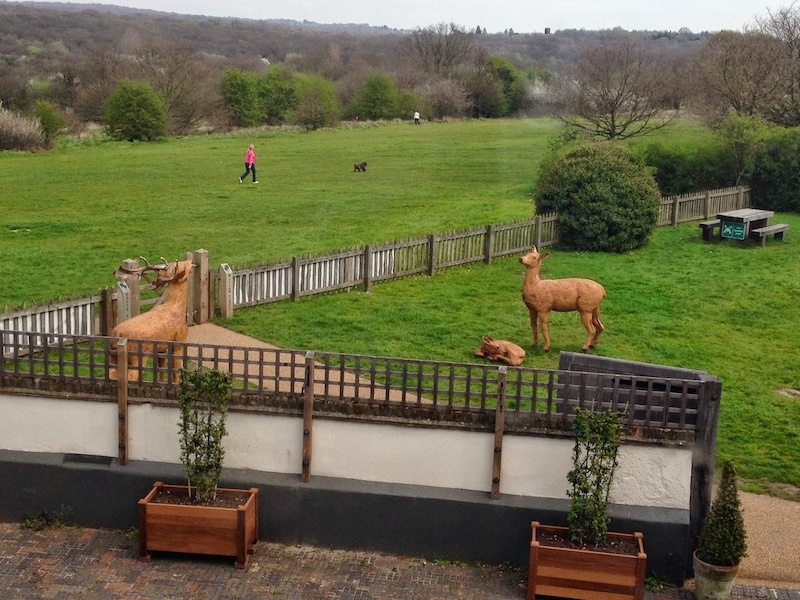 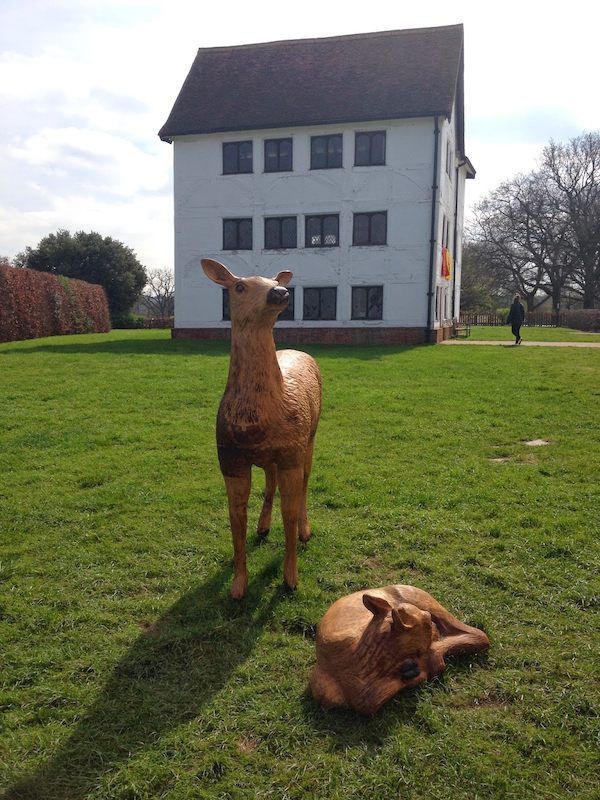 After sourcing the wood and making the sculpture elsewhere, the bear went for an interesting journey on the M25 and caused a little bit of havoc. 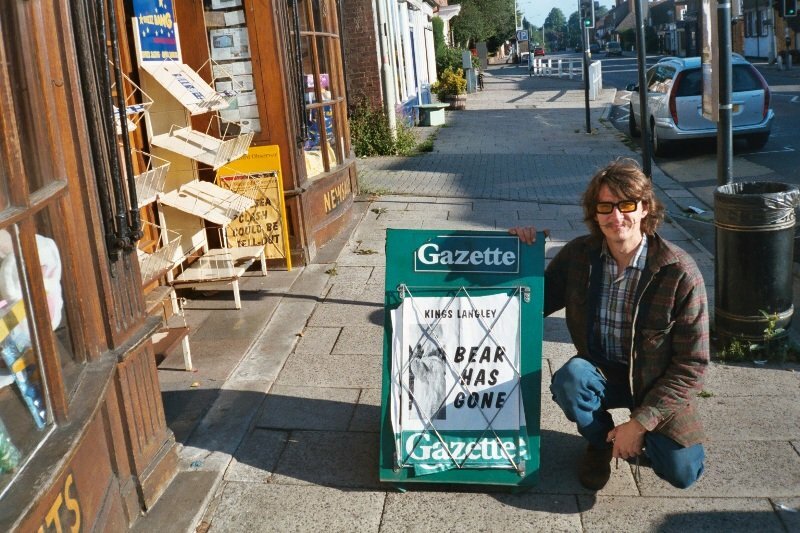 Bears are extinct in this country didn't you know? 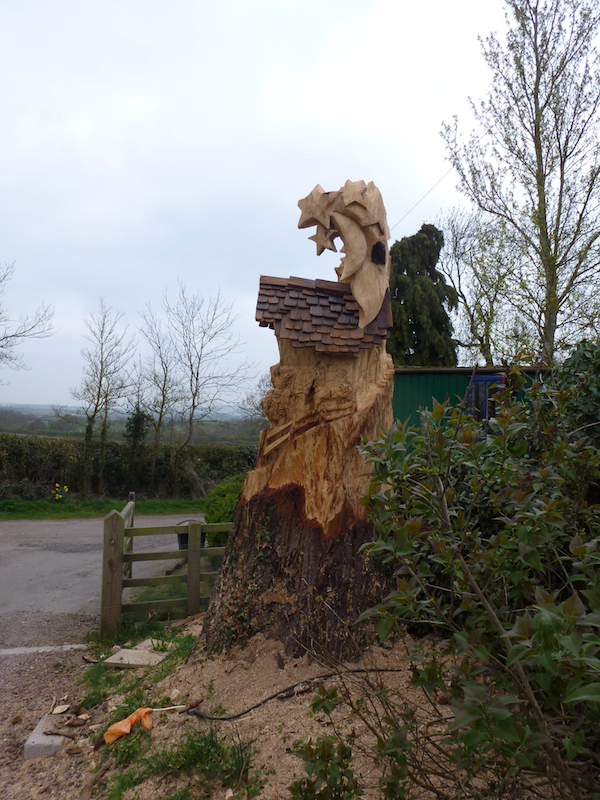 The dragon was painstakingly hand carved from pear tree, on the premises of Edward II; I lived here on top of where the old Palace once stood. 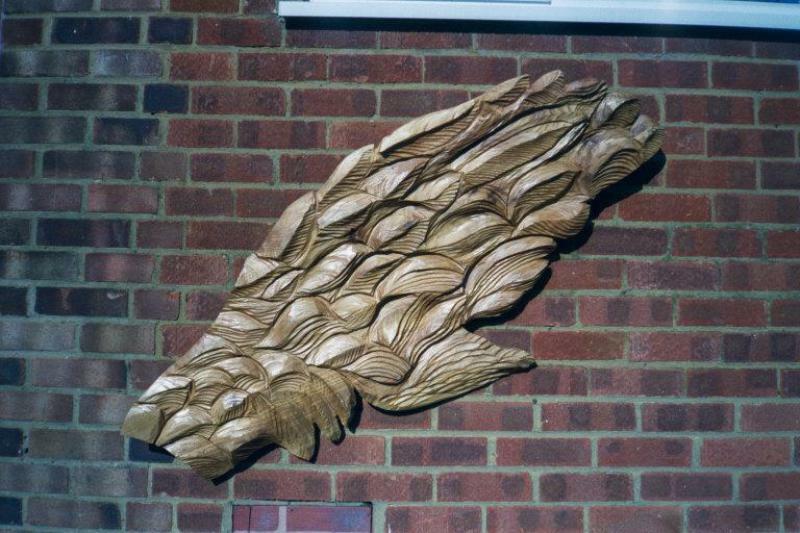 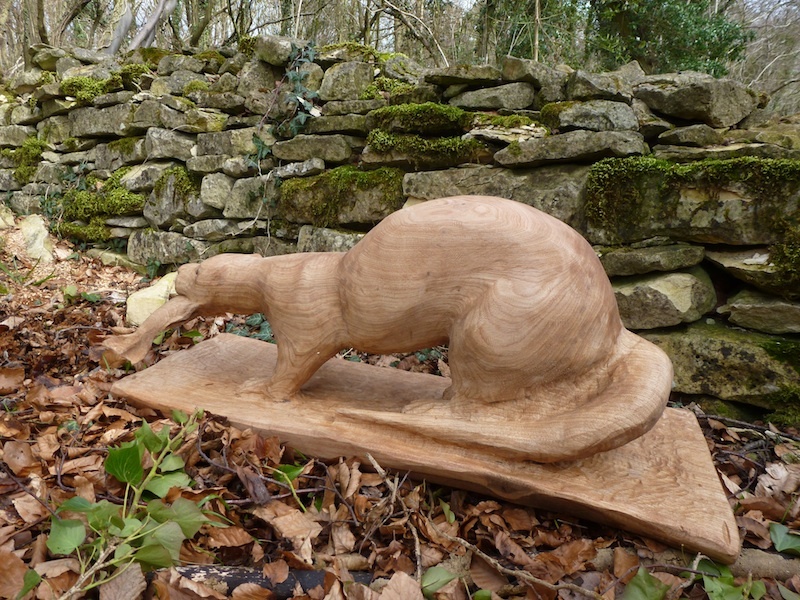 In the naive early days of my business i spent a whole year carving this for a measly commission, which never got paid. 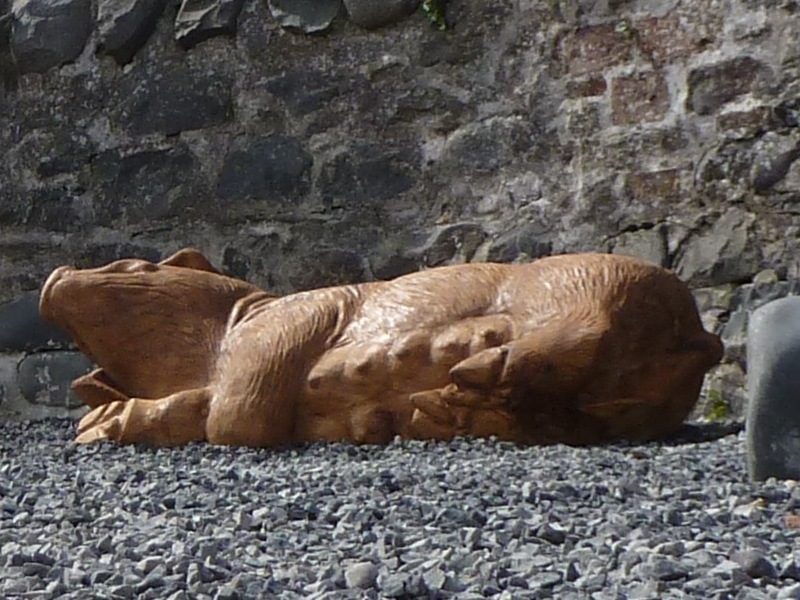 For this reason the Dragon remains and although I’m rather fond of it, i don’t have the space (it need’s a minimum height of 4.5m so there is a 2 metre clearance to be able to walk underneath it) and will consider any reasonable offers.